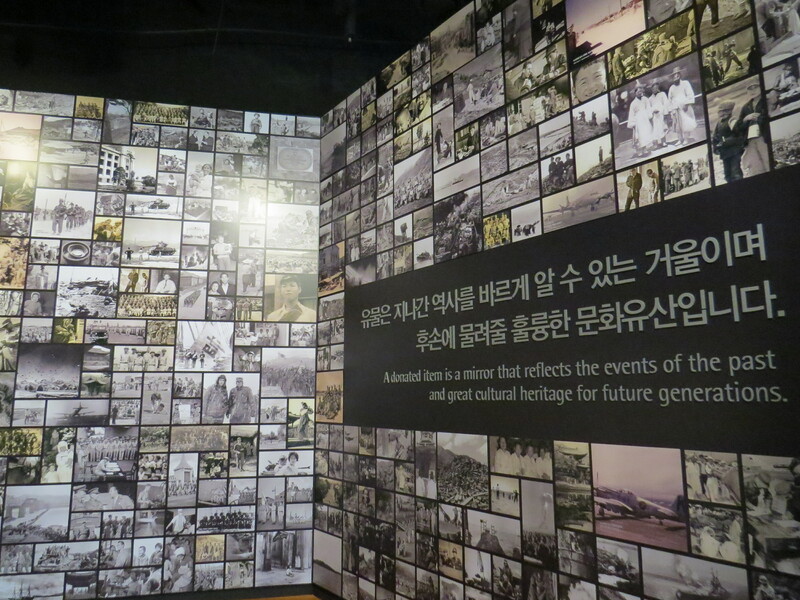 Here’s a photo roundup from Seoul’s great museums – the National Museum of Korea, Museum of Modern and Contemporary Arts and War Memorial (military museum). 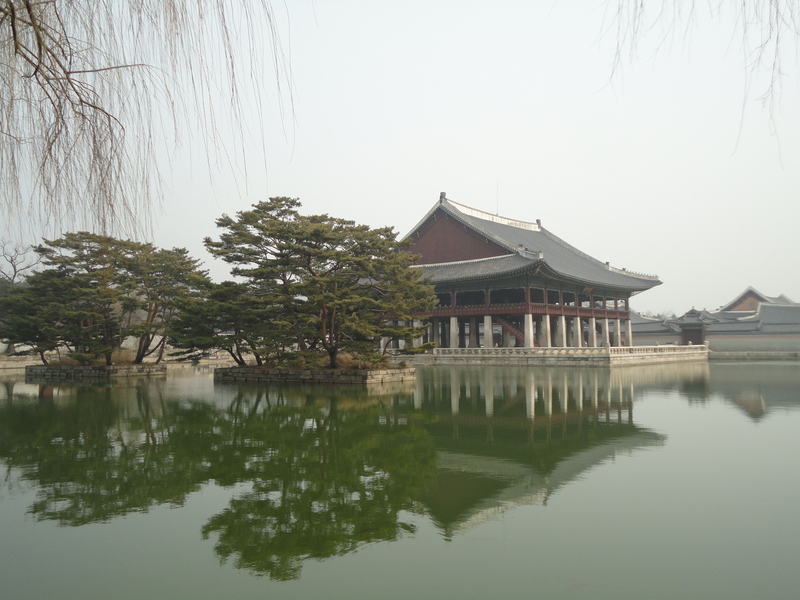 This is the last of my Seoul travel posts so that’s it for South Korea for now. 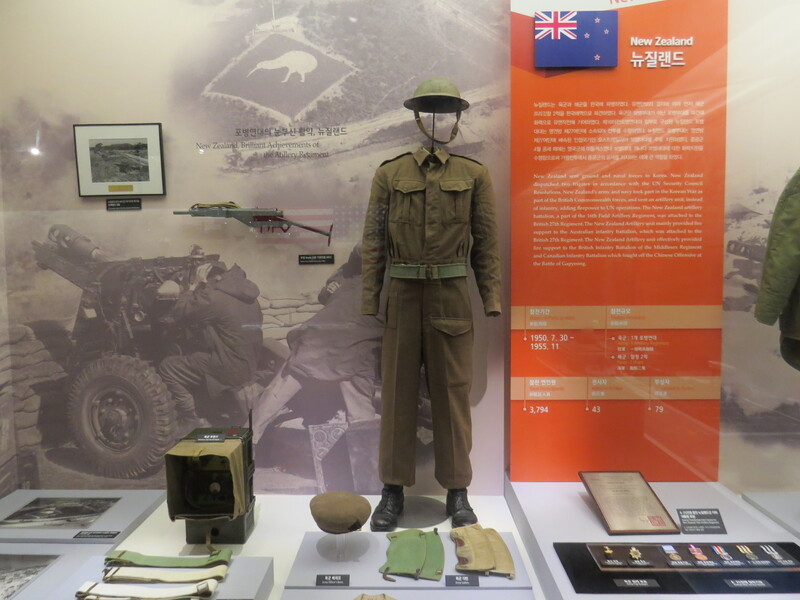 There was a display of military uniforms and equipment for the 16 nations who contributed troops to help South Korea. 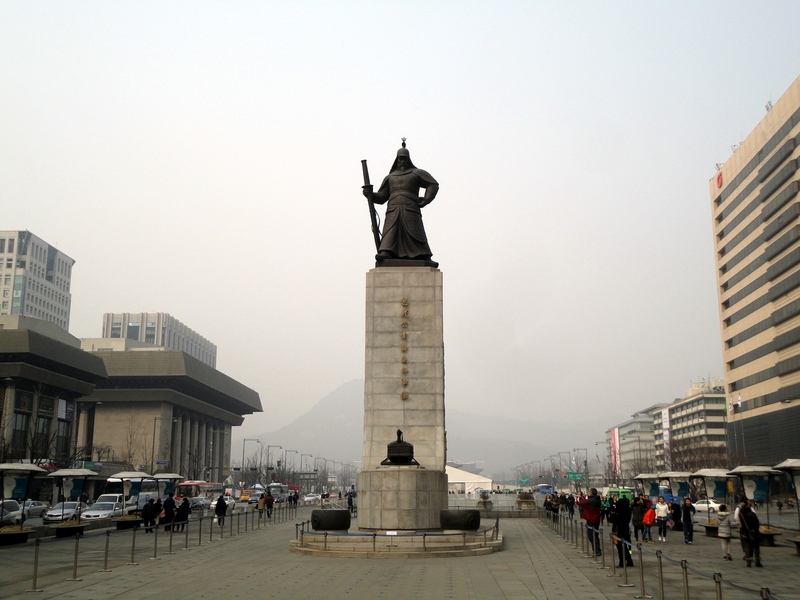 Crossing the street from Gyeonbokgung palace takes you to Sejongno (also known as Sejong-ro) boulevard, along which stand statues of King Sejong the Great and Admiral Yi Sun-sin, a 16th century naval admiral who is probably South Korea’s most admired war hero for defeating the Japanese. 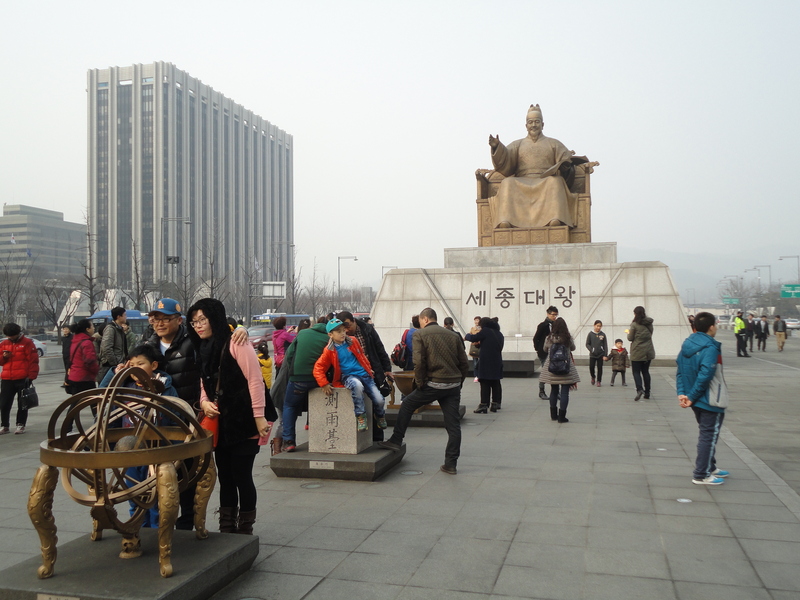 King Sejong the Great, as you can tell from his full title, wasn’t too bad either – he apparently invented the Korean Hangul alphabet and encouraged scientific reform and innovations. When I passed by his statue, a bunch of Chinese tourists were paying their respects. 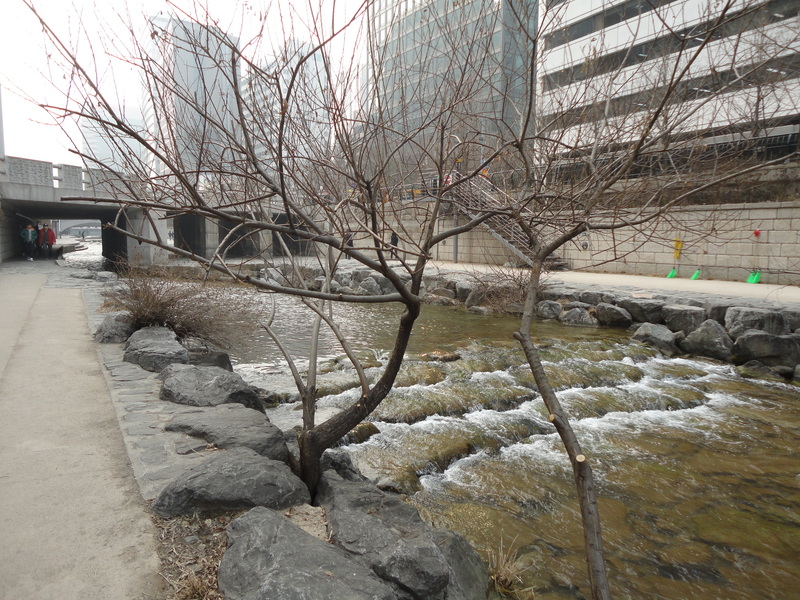 Going down further on Sejongno took me to the Cheonggyecheon stream, Seoul’s famous urban canal. Stretching 10.9km. 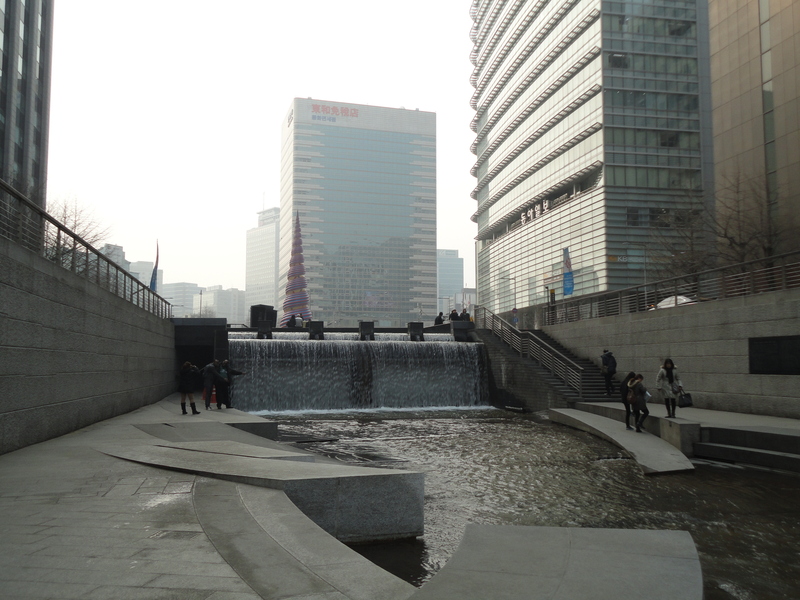 Cheonggyecheon stream is famous because it is the reincarnation of a stream that had been paved over to create a motorway, which was then removed (an impressive decision given how much priority cars often get over the environment), making it a long continuous pedestrian zone along which works of art and exhibitions are held. It wasn’t cheap, costing over US$200 million, but it sure seemed to be worth it. 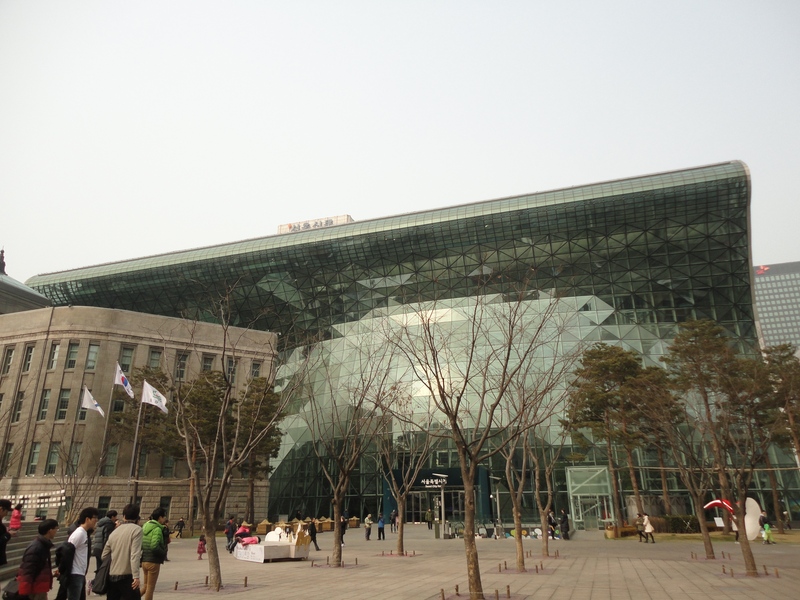 Seoul has a really interesting city hall that is a large, modern glass building superimposed onto an older concrete building. 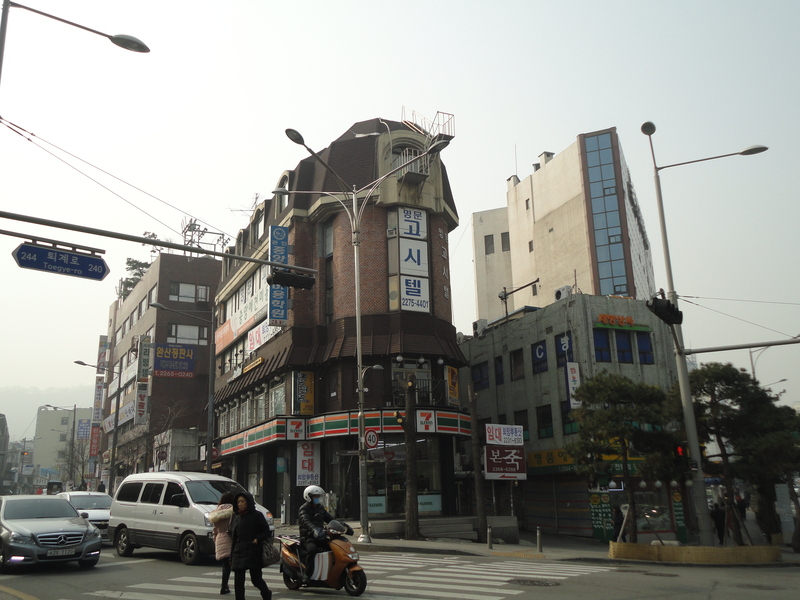 This older building was the city hall and was converted into the Seoul Metropolitan Library after the new building was constructed. 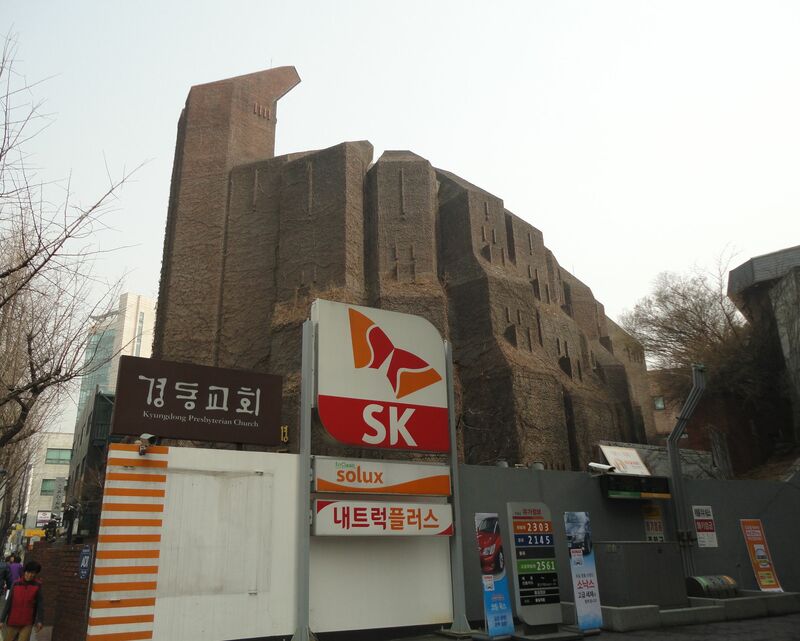 When I passed by there, a skating rink was set up in front of this combined building with dozens of young Koreans skating to their heart’s delight. 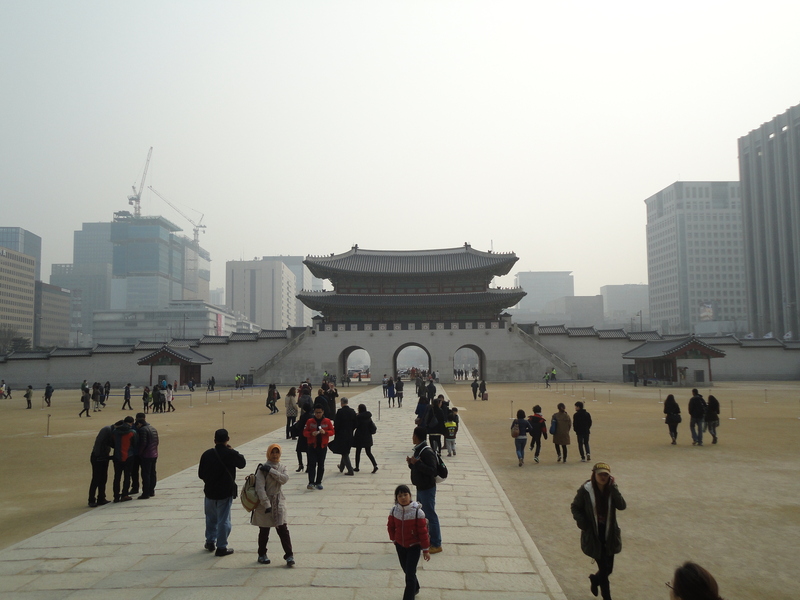 Bonus pic if you made it all the way down here – Seoul’s Namdaemun (great south city gate), also known as Sungnyemun. It’s one of the city’s main landmarks but was heavily damaged by arson in 2008. 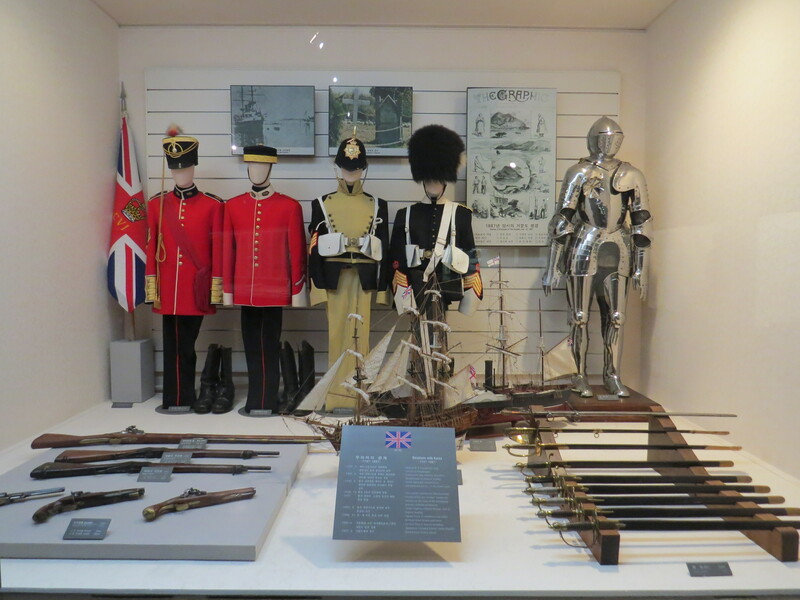 Restoration was completed in 2013 which is why it looks so new. 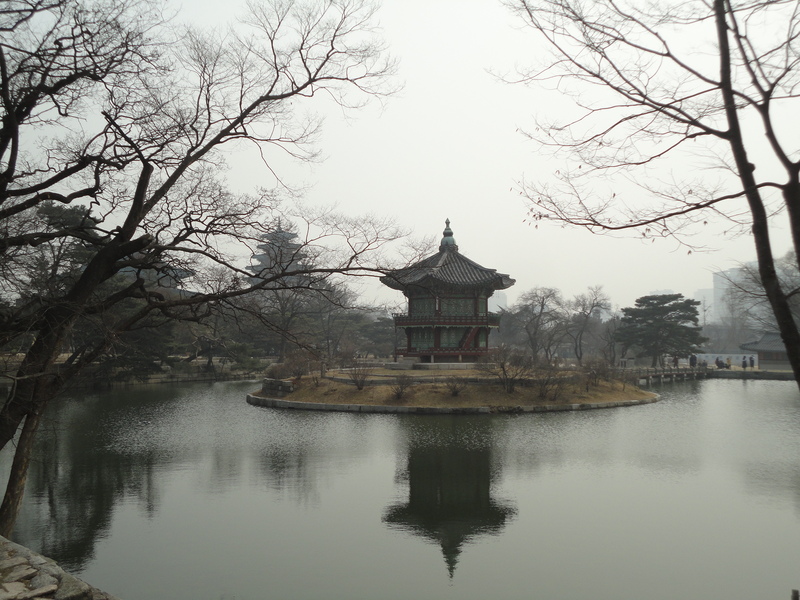 Seoul is one of the best cities I’ve visited, right up there with the likes of Shanghai, Osaka, Hanoi and London. 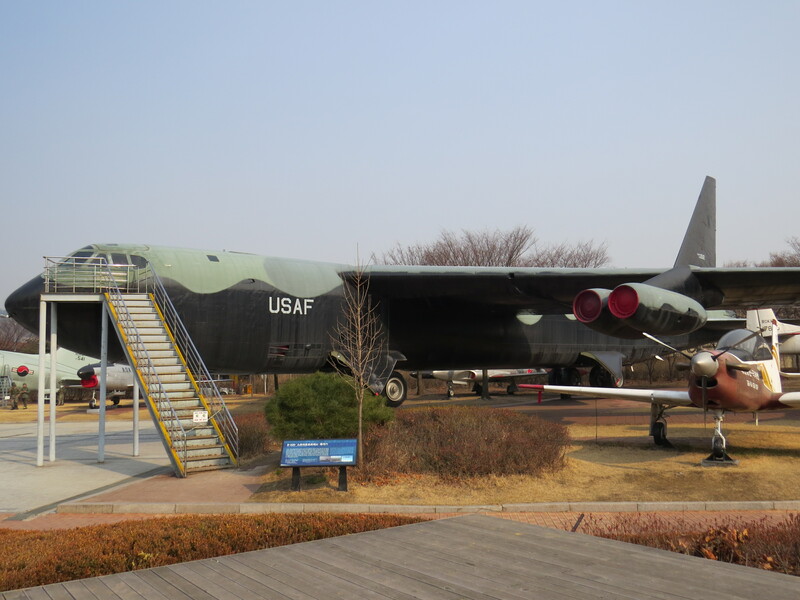 One of the reasons is that it has the most impressive military museum I’ve ever visited, with basically an entire mini army and air force to the side, while its national history museum and contemporary arts museum are also quite good. 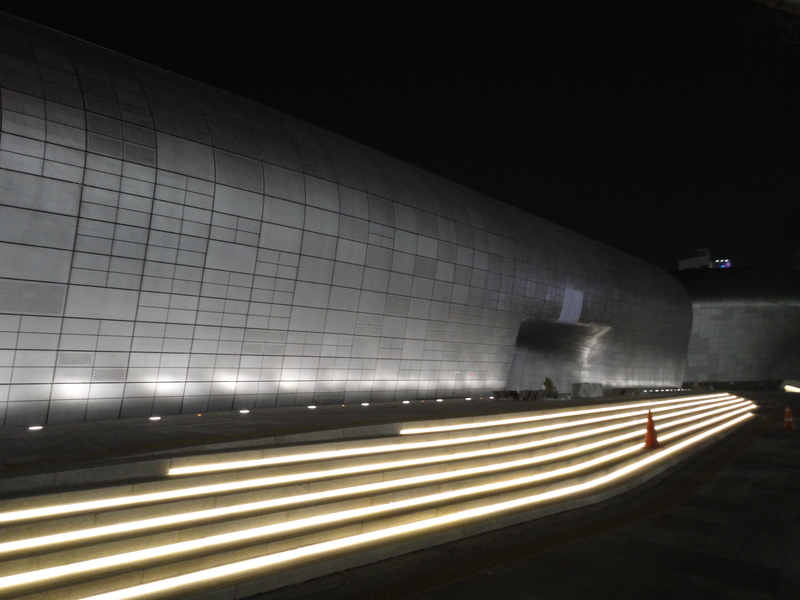 The military museum or War Memorial of Korea is a huge, formidable gray building (it used to be the country’s military headquarters). 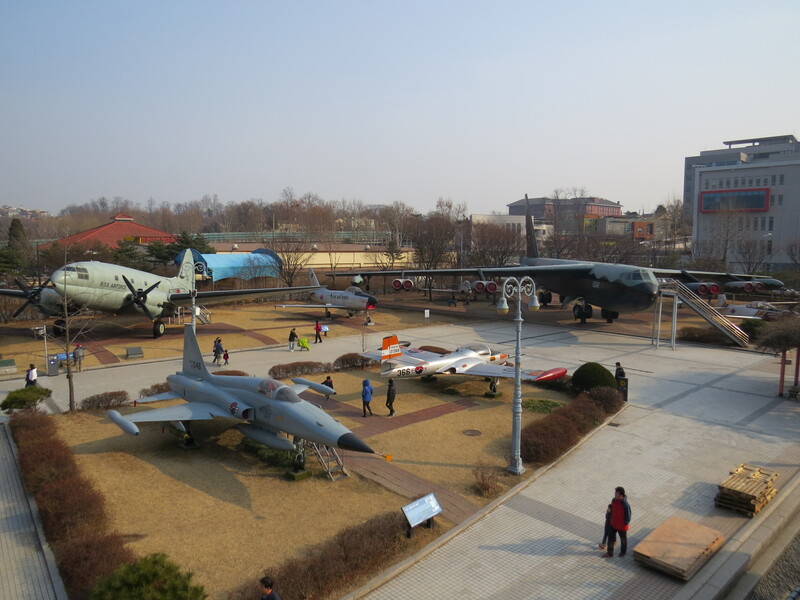 In front are a few large sculptures commemorating the Korean War and to the side are a fantastic collection of dozens of old warplanes, helicopters, tanks and even a full-scale replica of a navy frigate. 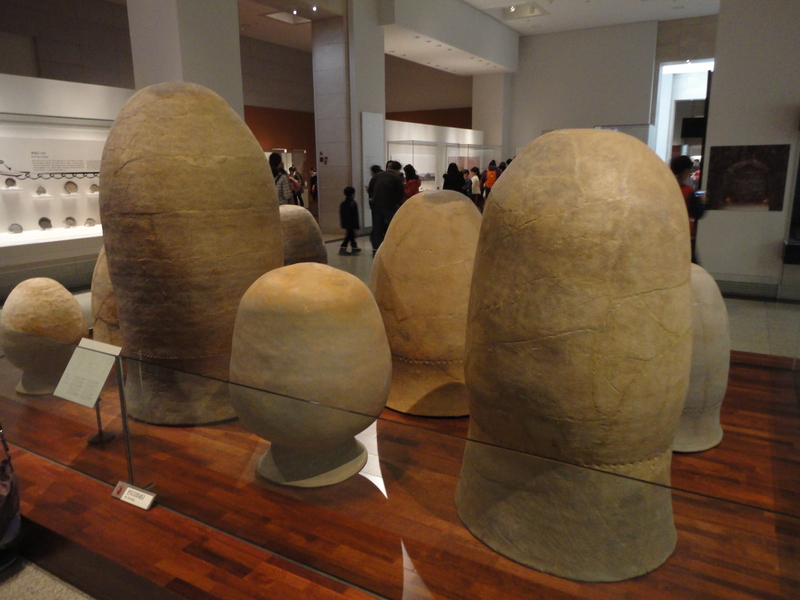 These could be an entire attraction itself, never mind going into the museum (but of course, you should). 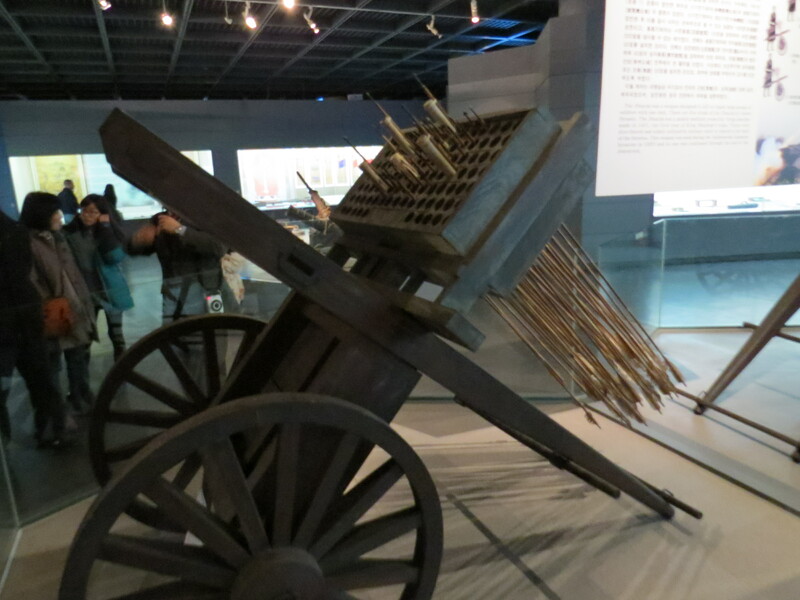 The museum proper features historic weaponry, a full-scale replica of a 16th-century turtle ship used to destroy invading Japanese navies, and a full section devoted to the Korean War, featuring a memorial to fallen UN soldiers and the flags, military memorabilia and info of each nation that sent troops to help South Korea fight off North Korea and China. 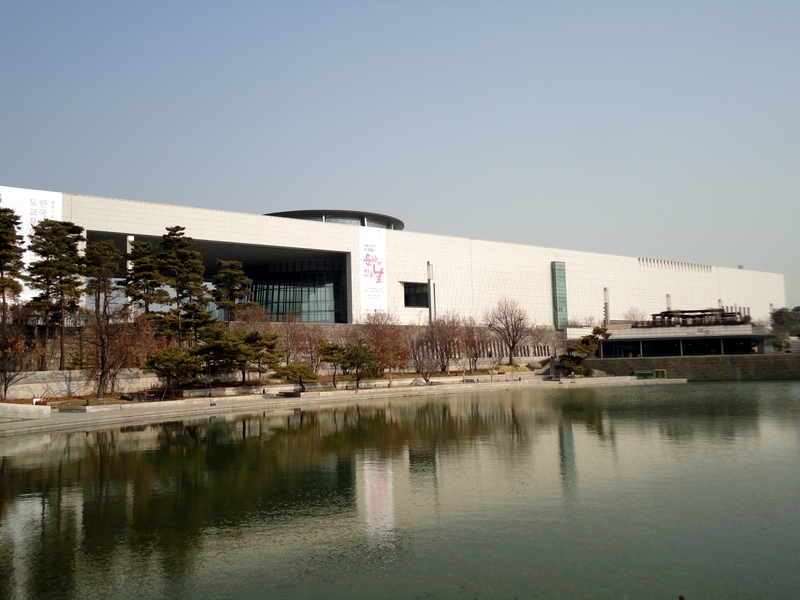 The National Museum of Korea history museum is also in a large, gray, imposing building (maybe there’s a trend here) with a nice artificial lake in front. 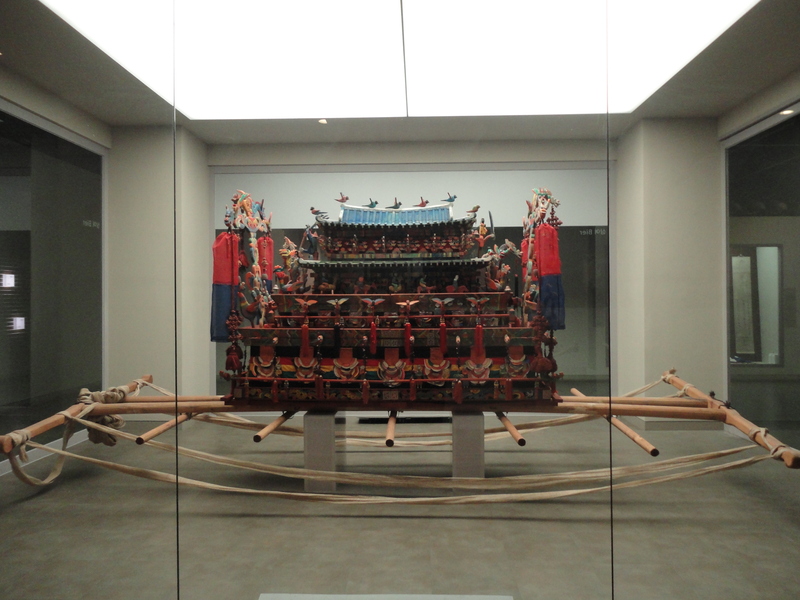 Like the British Museum in London and China’s national history museum in Beijing, this museum is completely free. 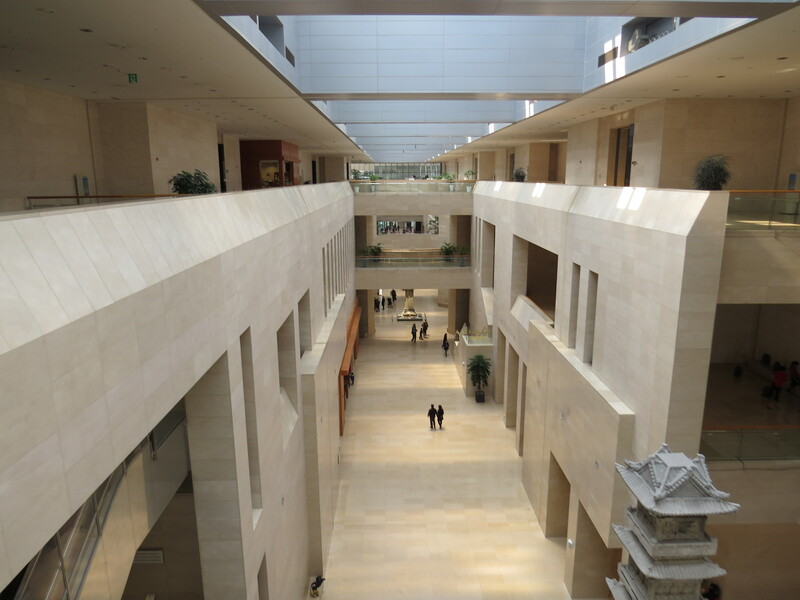 The building’s entrance is a huge, conical glass section that leads directly to the exhibits which are on several floors surrounding open space in the middle. 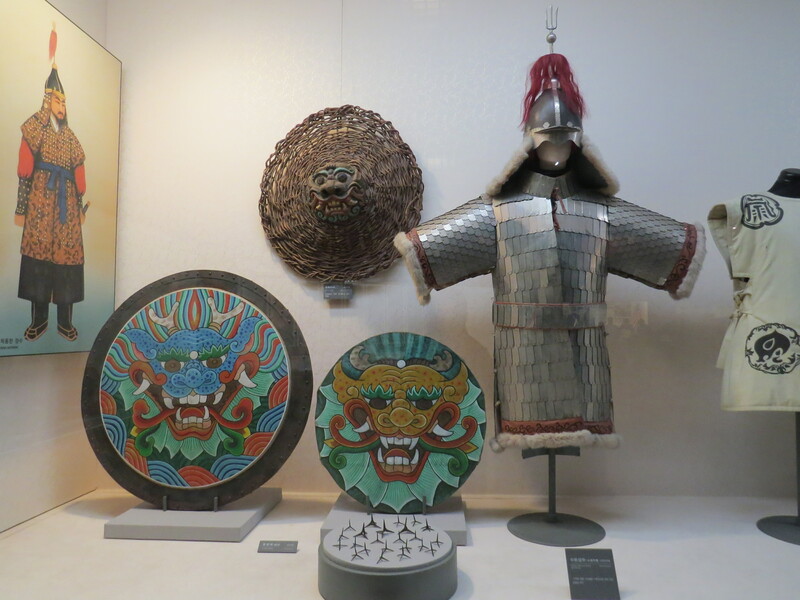 There were loads of Korean artifacts, paintings, and an Asian collection including Chinese, Japanese and South Asian items. 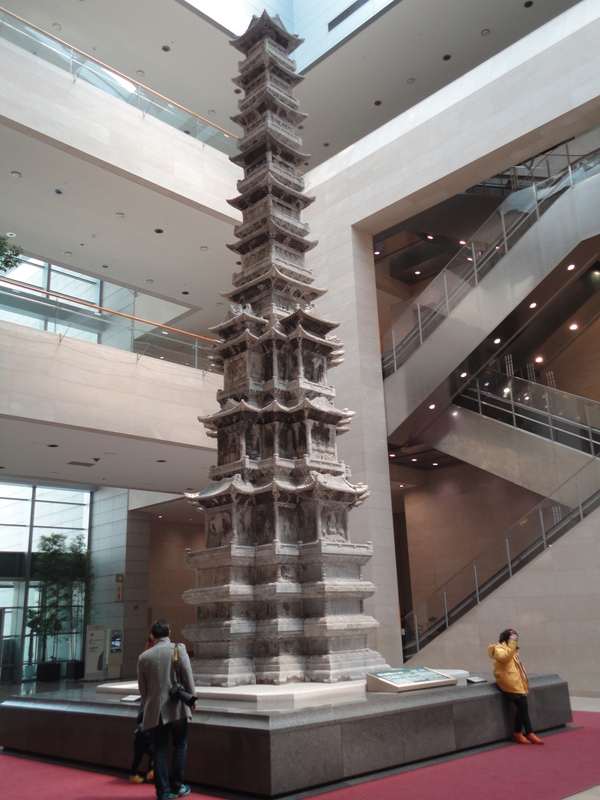 Frankly, the ancient Korean artifacts didn’t impress me too much but what interested me more was Korean history. 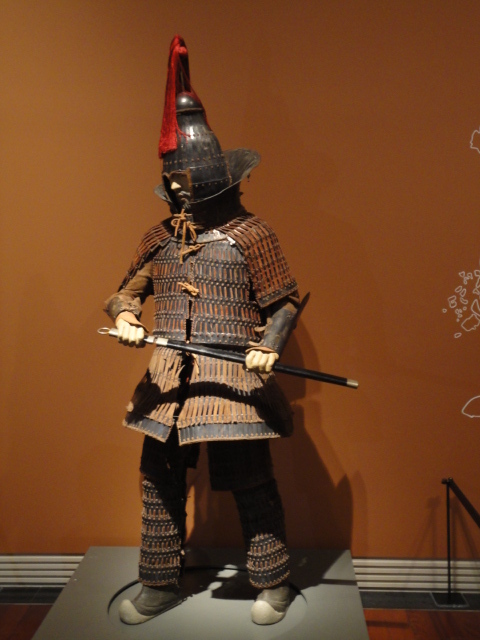 I learnt from the info on display that until the 7th century AD, there were three Korean kingdoms ( Goguryeo, Baekje, Silla,) that eventually became a unified entity after Silla, allied with China’s ruling Tang dynasty, conquered the other two kingdoms. 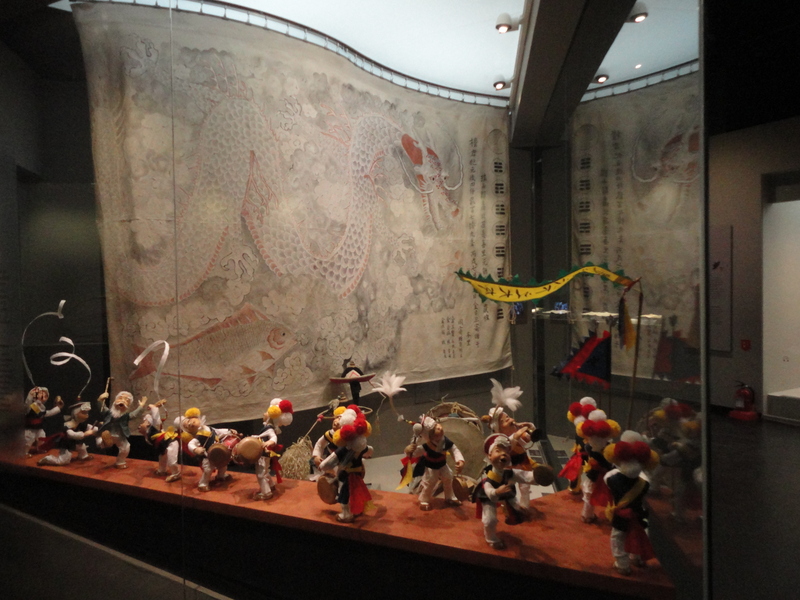 The National Museum of Modern and Contemporary Art (MMCA) was new, having just opened in January 2014, and was built at a cost of US$230 million. 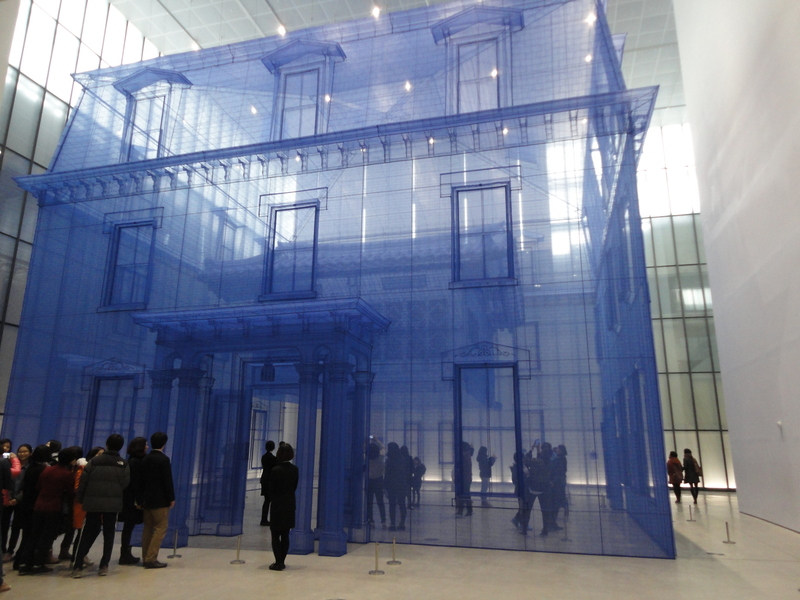 Normally contemporary art is not my thing and I wouldn’t go out specifically to view it, but I made an exception in this case due to all the articles I’d seen about this museum. 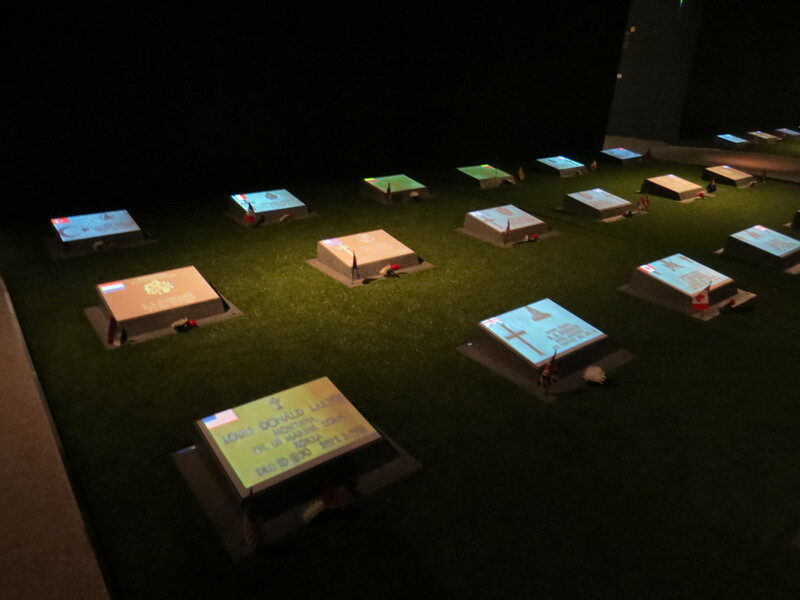 The MMCA (Seoul branch, there are other branches elsewhere in the nation) turned out to be worth it. 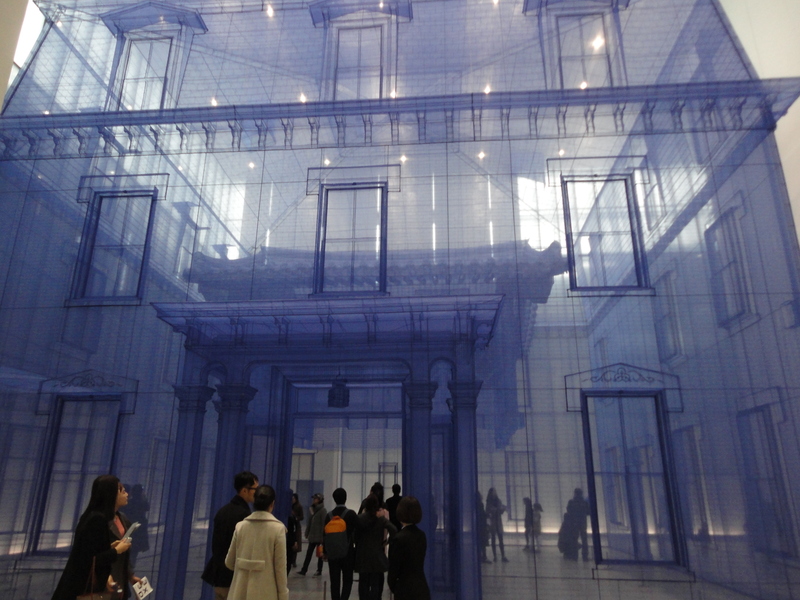 The feature attraction was a giant transparent, hollow house made out of mesh cloth containing a smaller Korean house, a hanok, inside and was called “Home Within Home Within Home Within Home Within Home.” (really). 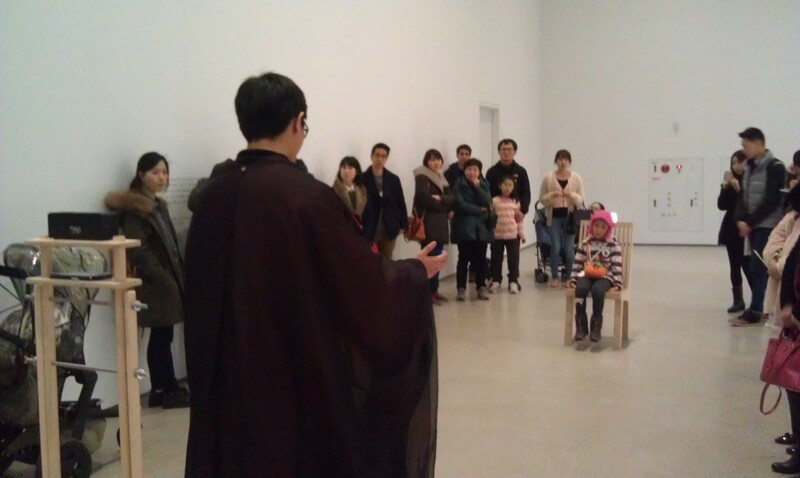 There was also performance art with a soprano singing to a child, who was a visitor, sitting across from him, visual art and regular weird paintings that look like somebody took paint and threw it onto the canvass. I even saw a short film in the downstairs cinema which was big enough for a few hundred people about a Korean woman trying to remember a weird incident in the past involving answering a casting call of some sort. 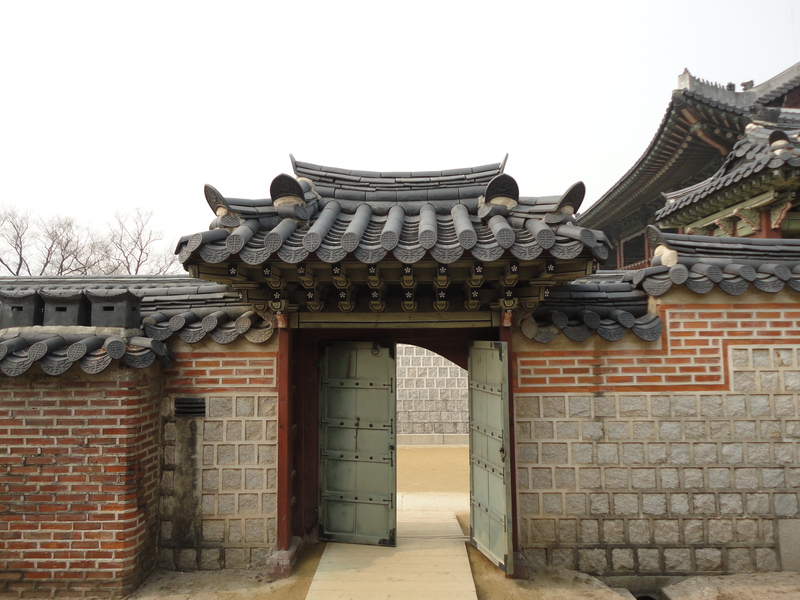 As the longtime capital of Korea, Seoul is home to five “Grand Palaces” that were built during the Joseon Dynasty (1392-1897). 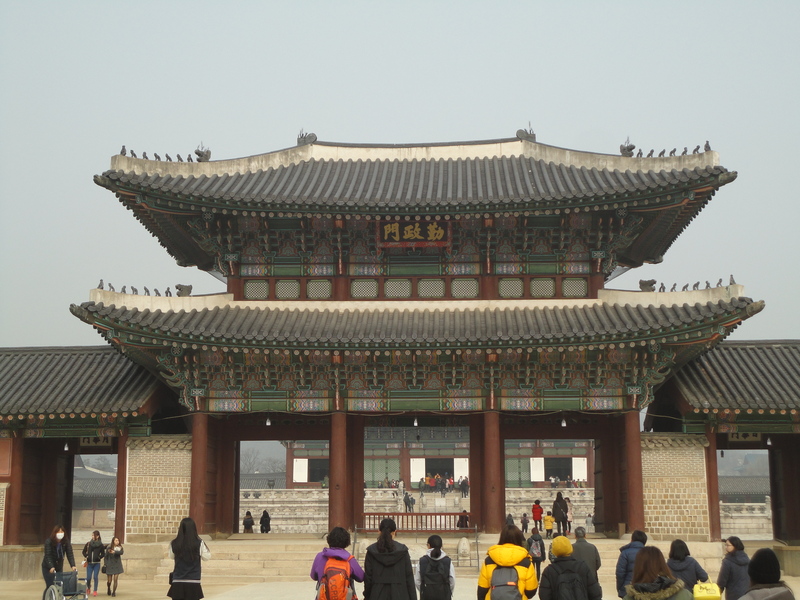 The biggest palace Gyeongbokgung was the home of kings and housed the main government offices. 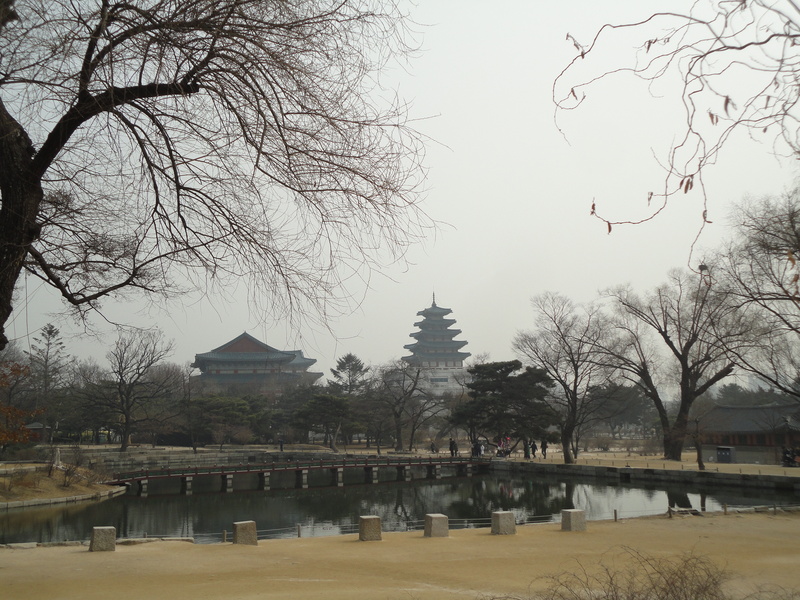 Gyeongbokgung is surrounded by massive stone walls guarded by entrance towers and once you pass the entrance tower, there is a large, open assembly ground which leads into the palace compound proper. 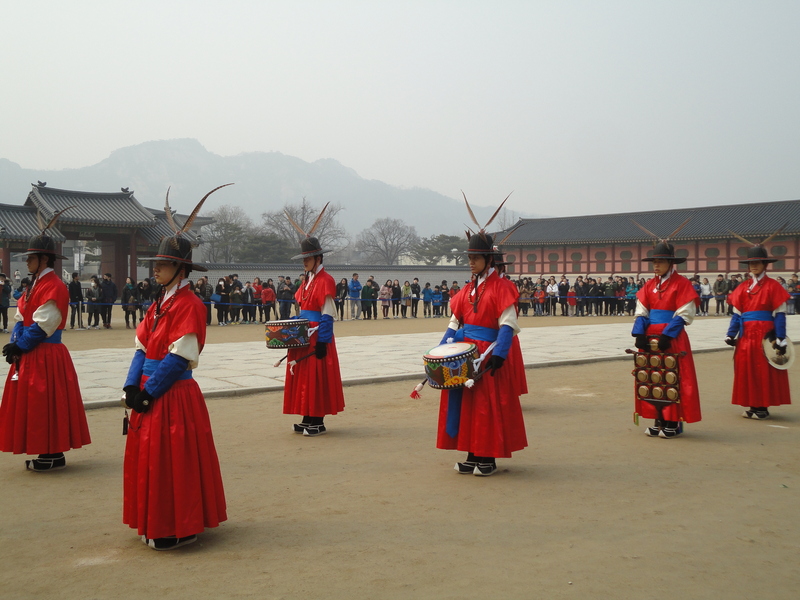 When I went there, I was fortunate to catch an elaborate change-of-guard ceremony on the assembly ground involving dozens of traditional costumed “guards” and “officers” marching to the sound of booming drums and instruments played by similarly costumed musicians, making it feel as if we were back in the Joseon Dynasty. 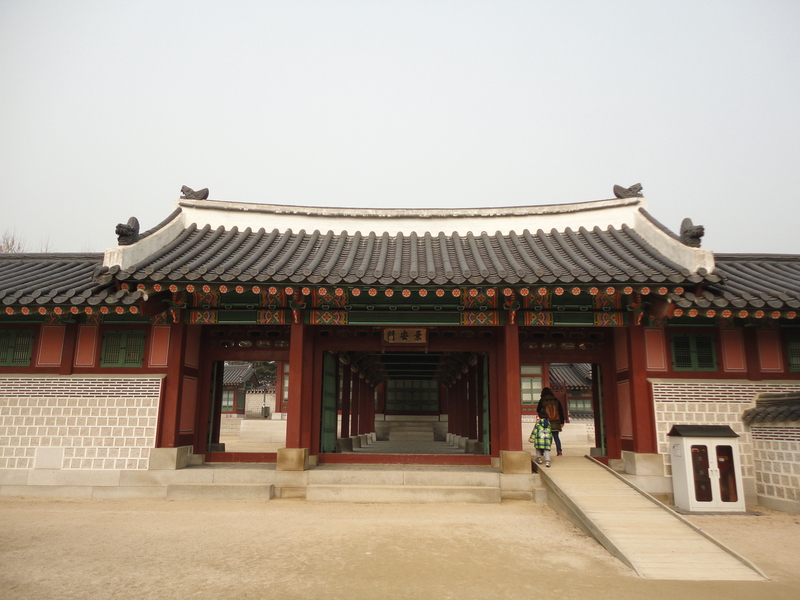 The compound is vast and features a lot of buildings including the main hall, various quarters, and shrines. 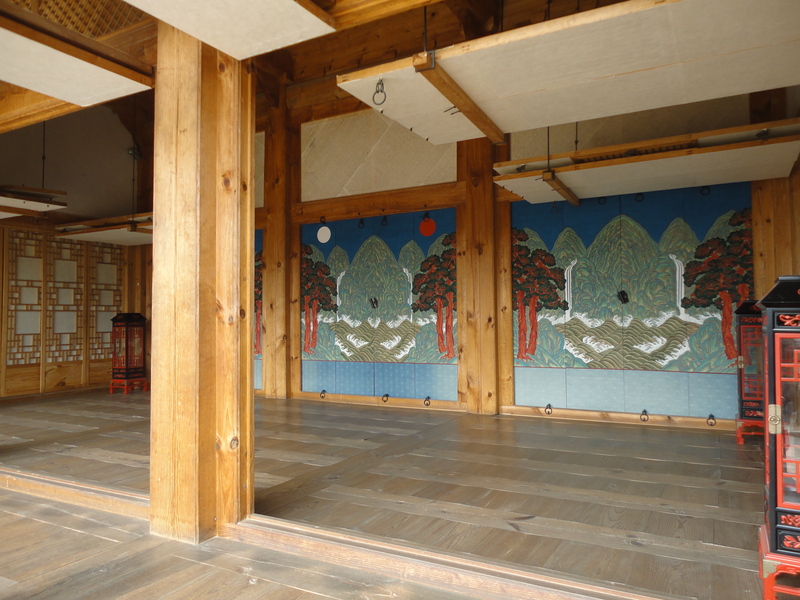 The most attractive building was the Gyeonghoeru banquet hall which was built atop dozens of stone pillars and stands next to a large pond. 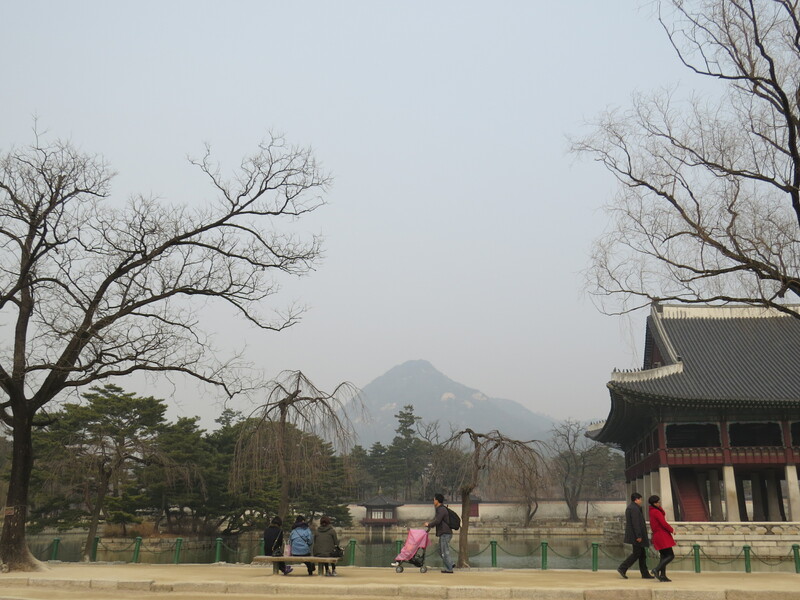 Now, it’s as impressive as the Forbidden Palace in Beijing, but there is a lot of open space with clumps of trees here and there, and mountains like Bukhansan looming in the background. 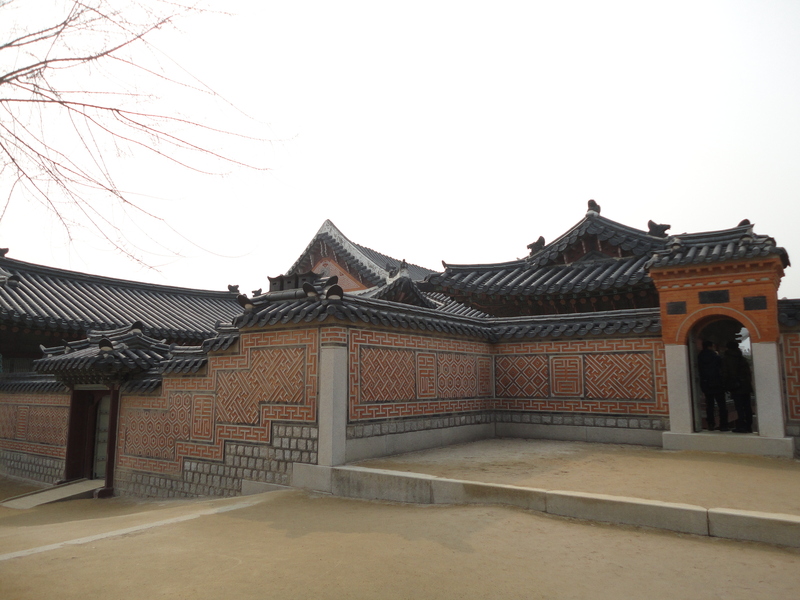 Apart from the main hall and Gyeonghoeru, the other buildings weren’t so spectacular but the entire palace compound as a whole was rather attractive. However, almost all these buildings are restorations or rebuilt, since the original palace buildings were destroyed or damaged during the Japanese occupation in the early 20th century. 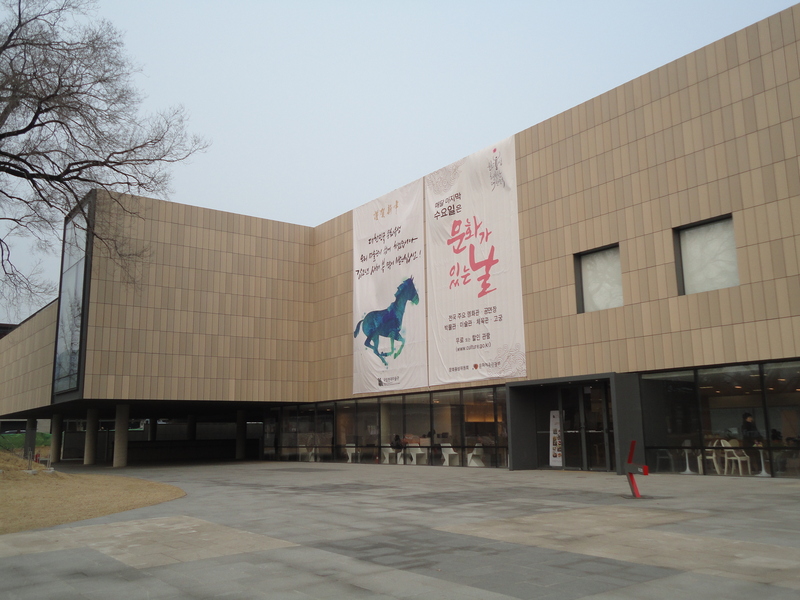 In the northeast corner is the National Folk museum, which exhibits folk costumes, instruments and other things used by Koreans in the past. 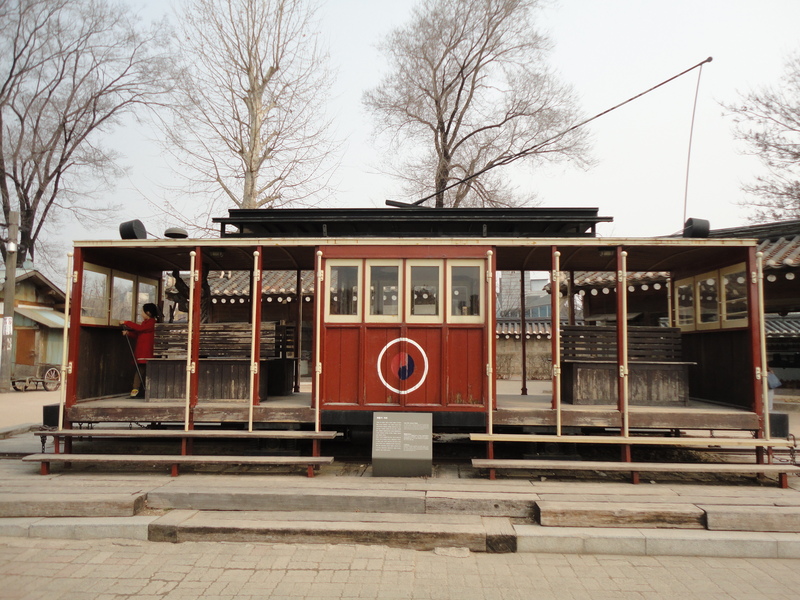 At the side stands an interesting replica of an old-time Korean neighborhood complete with an antique tram. 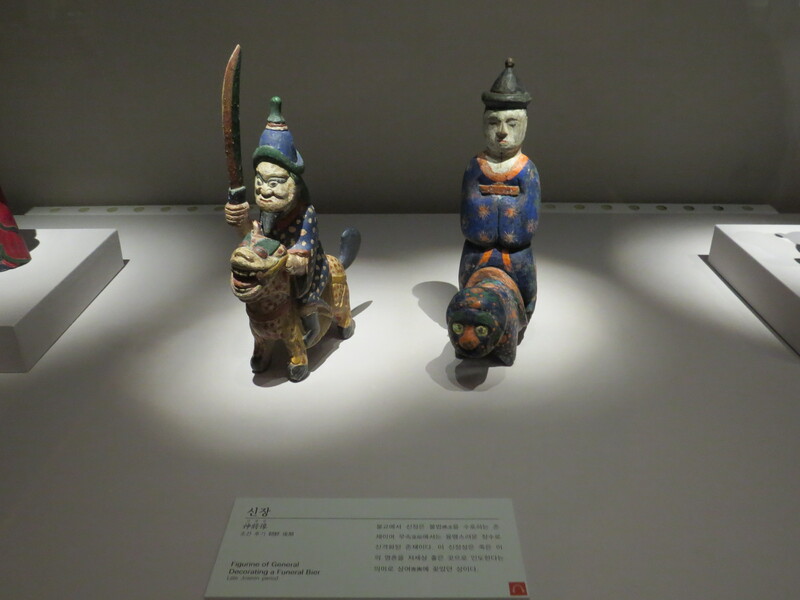 There’s also the National Palace Museum, which I didn’t visit, on the grounds. 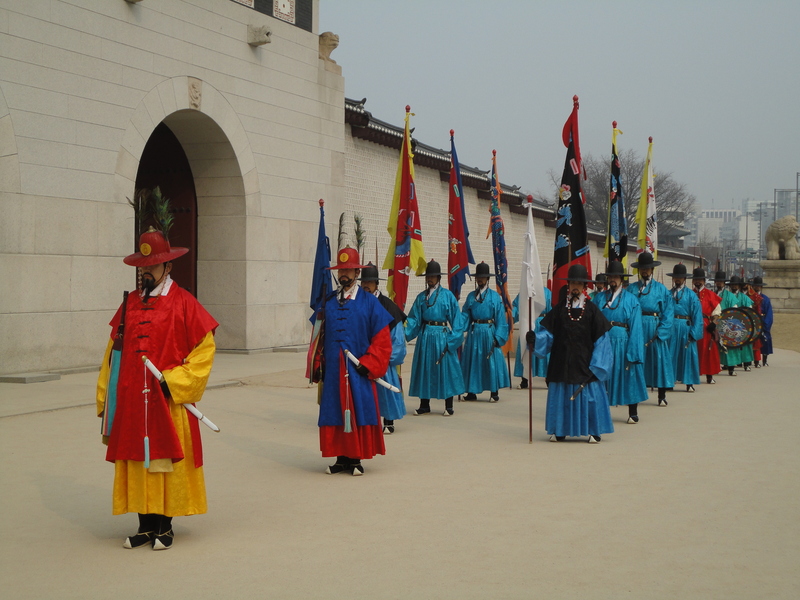 One of the most striking aspects about South Korea is that it is still technically in a state of war. Its adversary is its neighbor North Korea, which speaks the same language and has almost the same culture but is ruled by one of the world’s most despotic and repressive regimes. 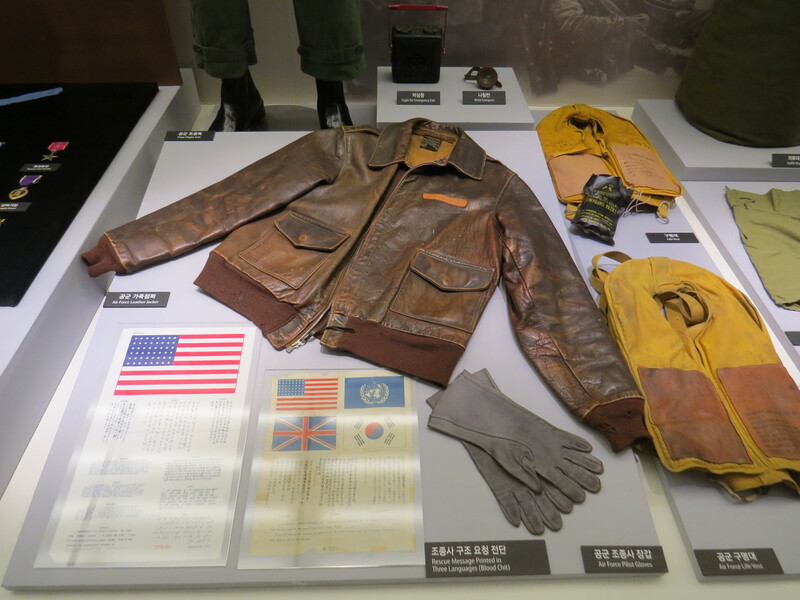 The two sides were divided after World War II and fought a devastating war in the 1950s, the Korean War, which saw the US and the UN intervene on the South’s side while China took part to help the North. It’s a sad development that has become part of normal life for the South so that for instance, military service is compulsory for all male citizens and subway stations have bomb raid instructions. 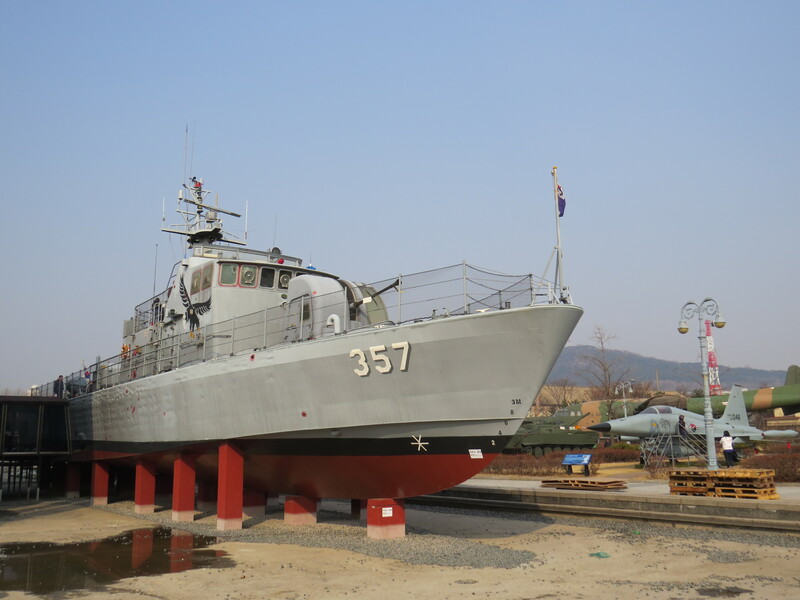 The most obvious indicator of this unresolved state of war is the 250-km border between the two Koreas, which is heavily guarded by both nations’ military forces, with a no man’s land buffer zone between them, the demilitarized zone (DMZ). The name is ironic because the immediate boundaries on both sides are heavily militarized. 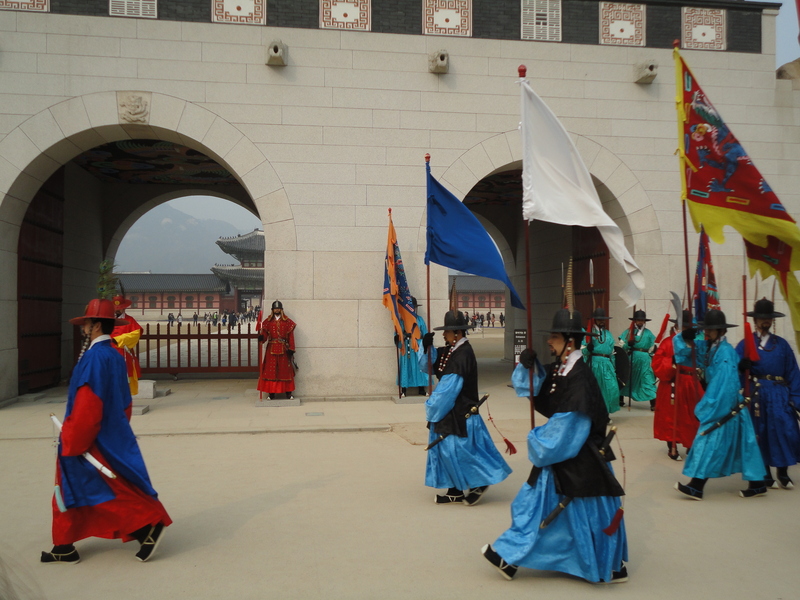 It is possible to visit the DMZ or the border (or both) from Seoul on guided tours that you can easily book while there, as I did. 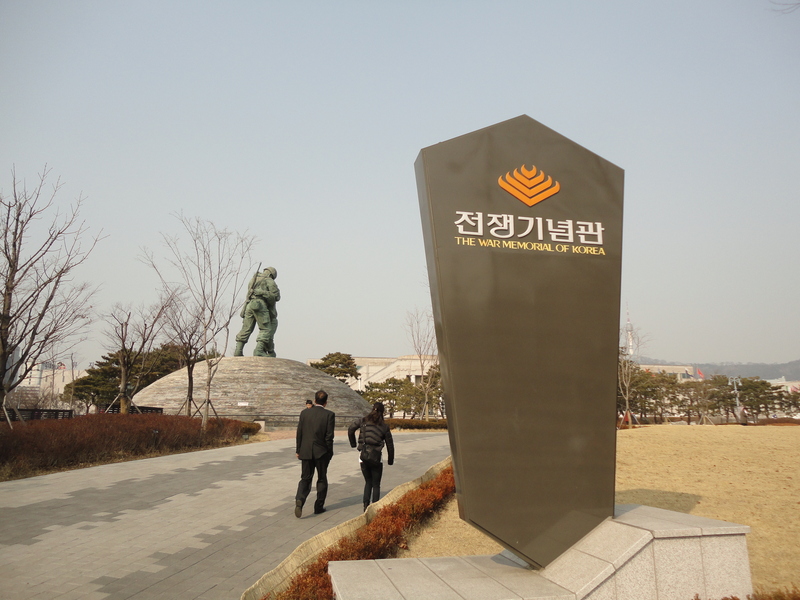 Actually you can only visit the DMZ while on a guided tour. 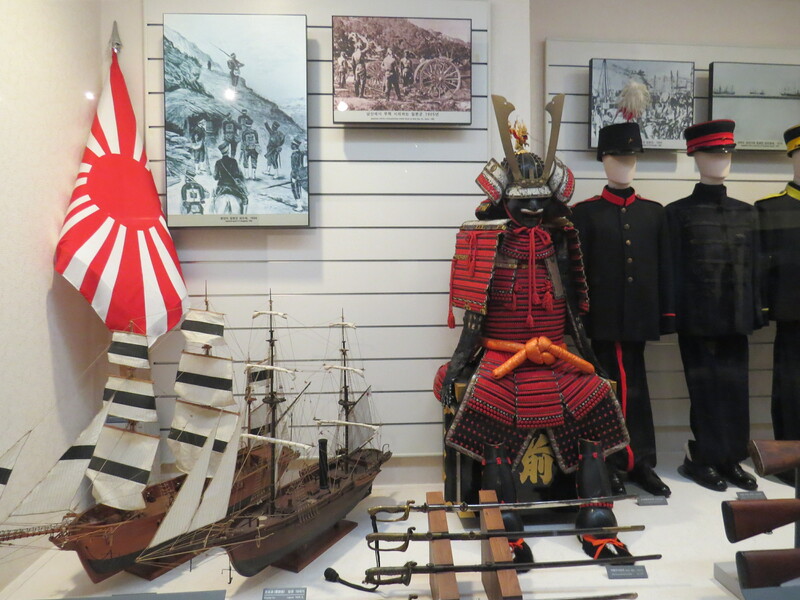 It’s probably the only military zone open to tourists. 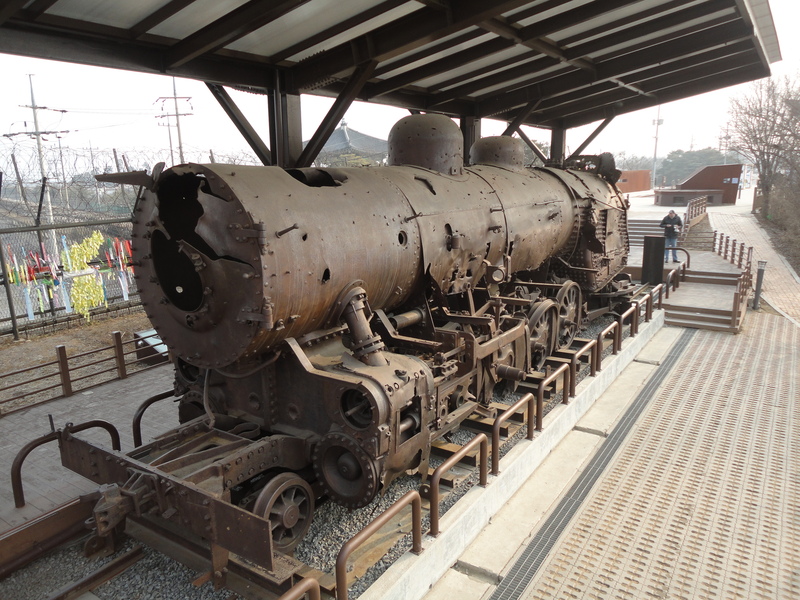 I chose a tour that went to the S. Korean border of the DMZ and the stops included a tunnel which North Korea dug in the 1970s in order to invade the South, the South’s northermost train station, and an observation post that overlooks the actual DMZ and from which you can see into North Korea on a clear day. 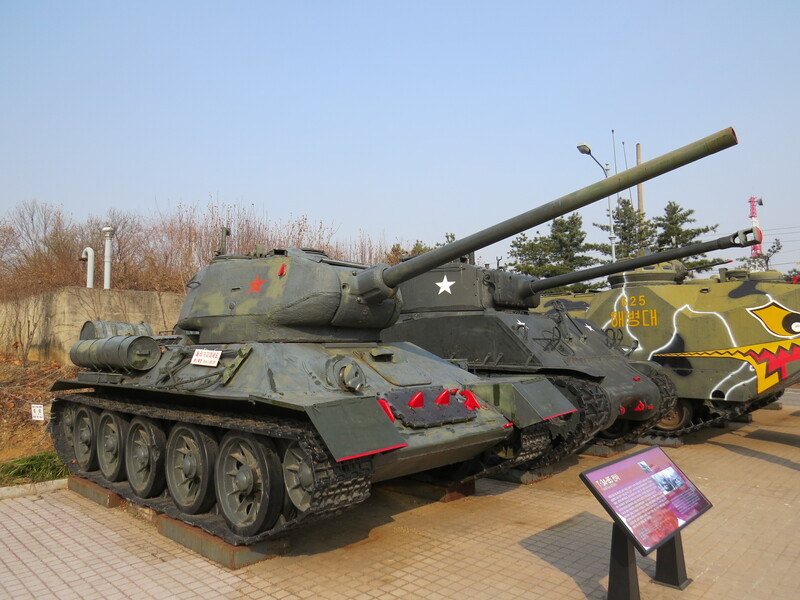 Other tours actually go into the DMZ to Camp Bonifas, a US-S. Korean base, and the Joint Security Area (Panmumjeom), a place in the center of the DMZ where both sides meet and sign agreements, and which features an actual exit point to North Korea, though of course nobody can go through it. 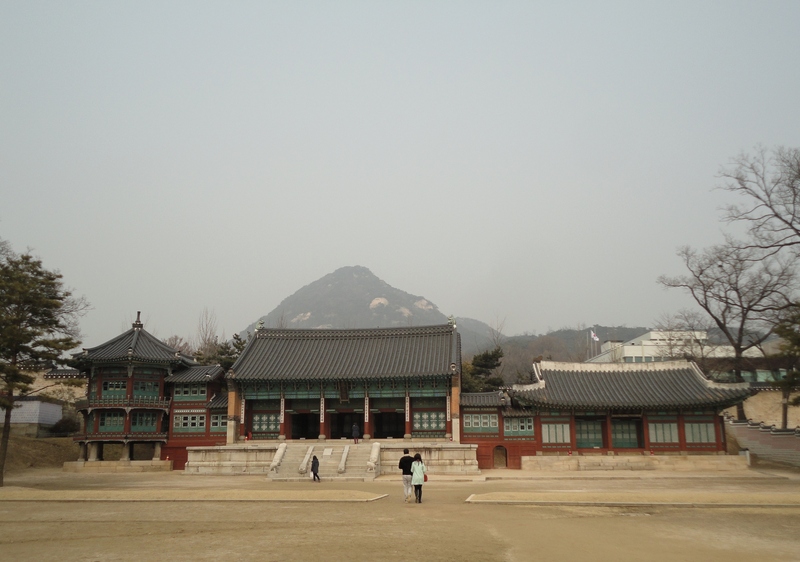 I would definitely like to visit Panmumjeom if I return to Seoul. 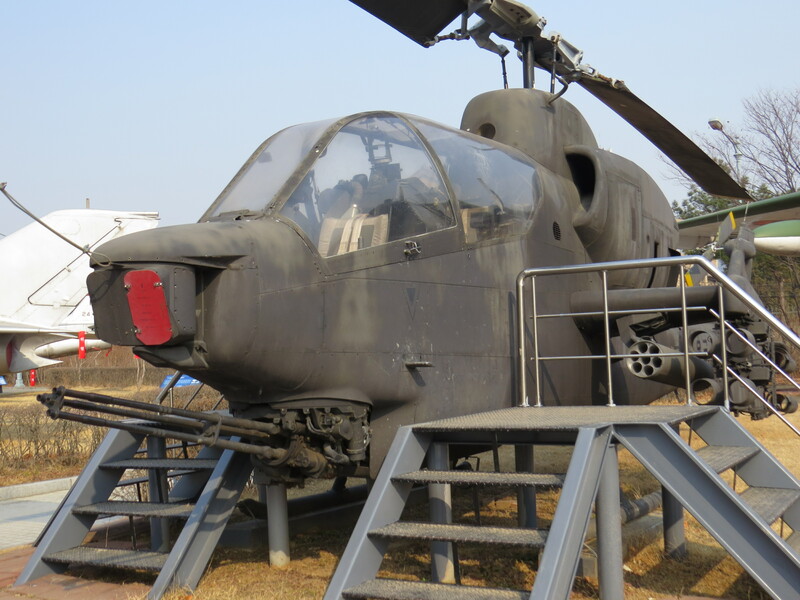 As you leave Seoul to go north along the Han river, you’ll notice barbed wire fences along the side of the river and the area increasingly resembles a military zone. 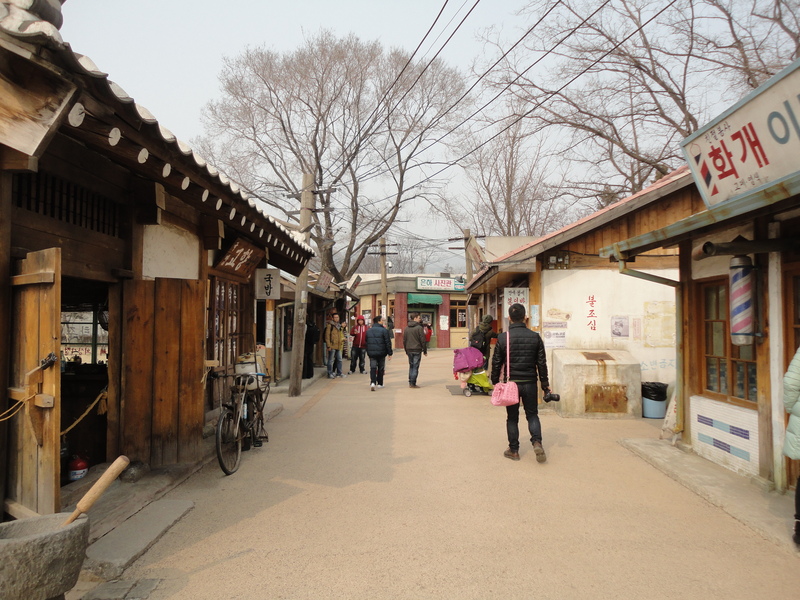 The first place the tour took us was Imjingak, a park built for Koreans who were unable to return to their homes because of the division and which is now a major tourist destination. 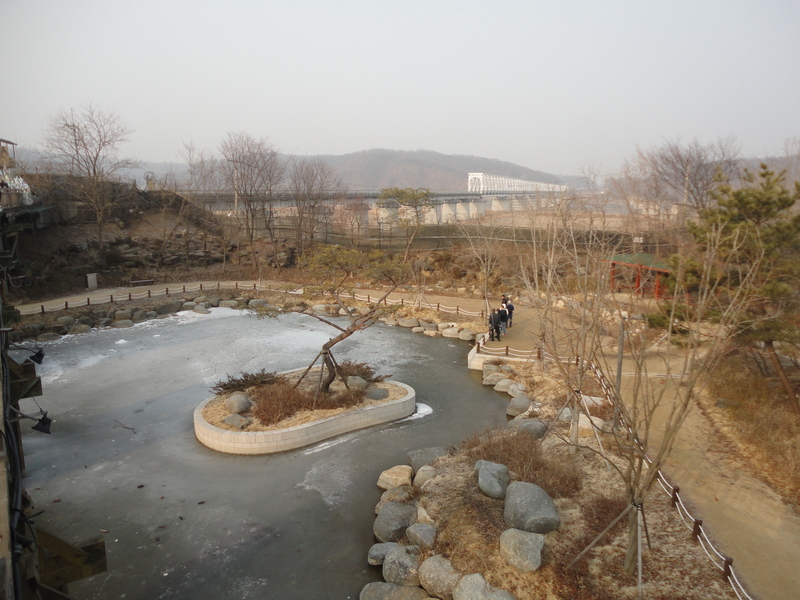 It features statues, a pool, a chain-link fence covered with ribbons and flags, the rusty remains of a train locomotive that had been destroyed during the Korean War, and the Bridge of Freedom, a small wooden walkway that spans a stream. 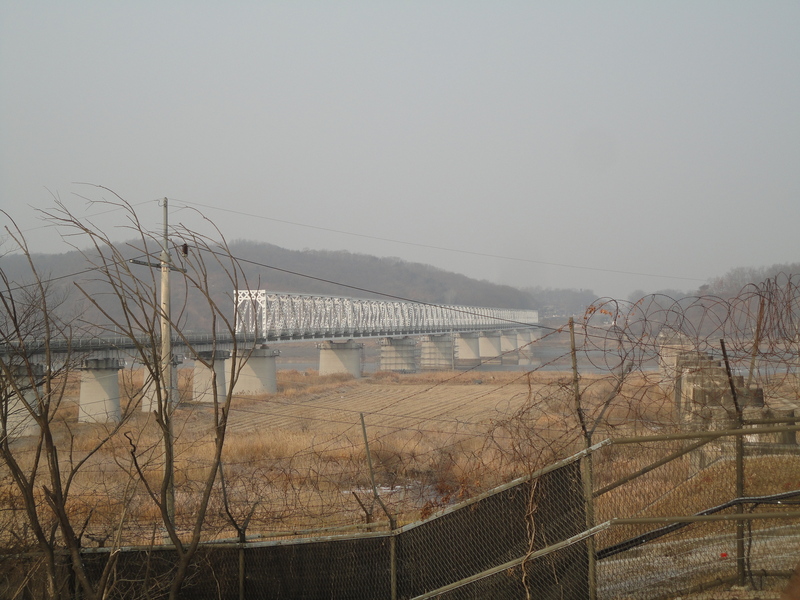 Confusingly, there is a rail bridge that spans the nearby Imjin river that is also known as the freedom bridge because thousands of freed Korean POWs used it after returning from the North during the Korean War. Before we headed further towards the DMZ on our bus, Korean soldiers came on board to check our passports, which are necessary to pass beyond. Then we went to the Third Tunnel, one of four tunnels North Korea dug to attempt an invasion of South Korea in the 1970s. This tunnel was 1,635m in length and was intended to go to Seoul but fortunately was detected after a defector from the North told the South Korean military. 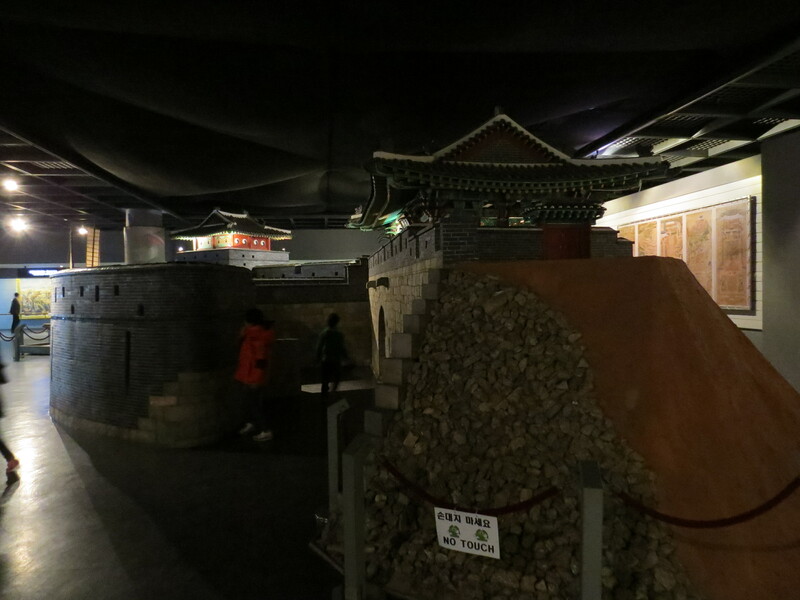 The South Korean army then dug into this tunnel and the other ones, and blocked them with concrete. The impish North Koreans claimed that these tunnels were for digging coal and they painted the tunnels black to give off the appearance that coal was dug. Visitors enter the tunnel down a long, gently descending ramp wearing hard hats (a must!) and walk along the tunnel, with some parts painted black by those dastardly North Koreans, until you reach a spot that is blocked off. Photos are not allowed. 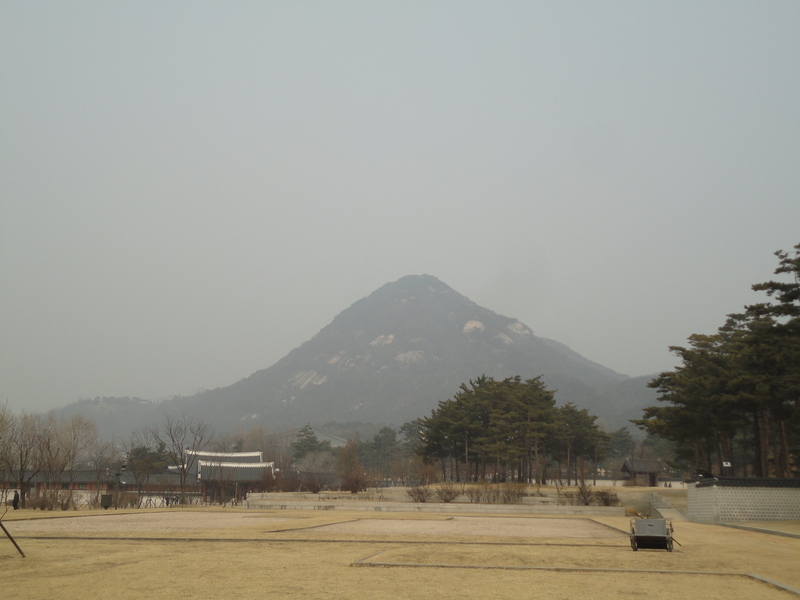 The main site is an observation post on a hill (Dora mountain) that allows people to look down into the buffer zone and to North Korea. Unfortunately the weather was rather hazy so I didn’t get a good view. 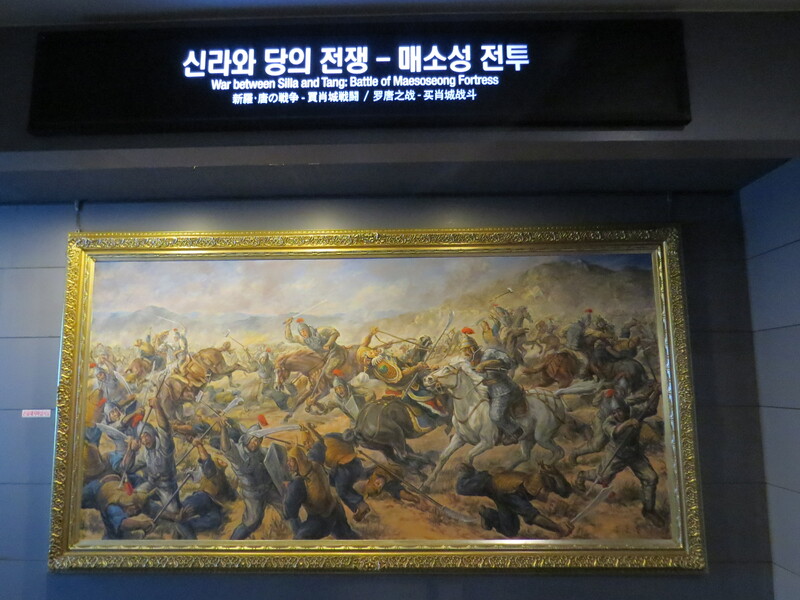 You can take pictures of the entire post and from the back of the observation deck but photos are not allowed right at the lookout point, our guide, a short vivacious Korean called Dora said, because any reflection caused by cameras might be seen by North Korean soldiers and induce them to open fire. Scary stuff. Further along the sides of the observation post, there were South Korean gun posts dug into the hill with soldiers manning machine guns. 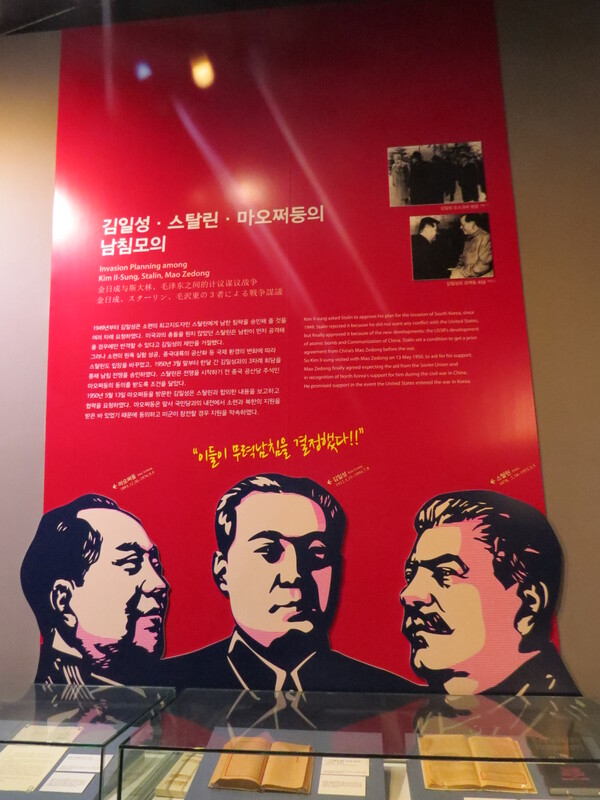 The last site we saw was a brand-new and hardly used train station, Dorasan, that was meant to service a North-South train line which does not exist yet and is basically is just a dream for now. 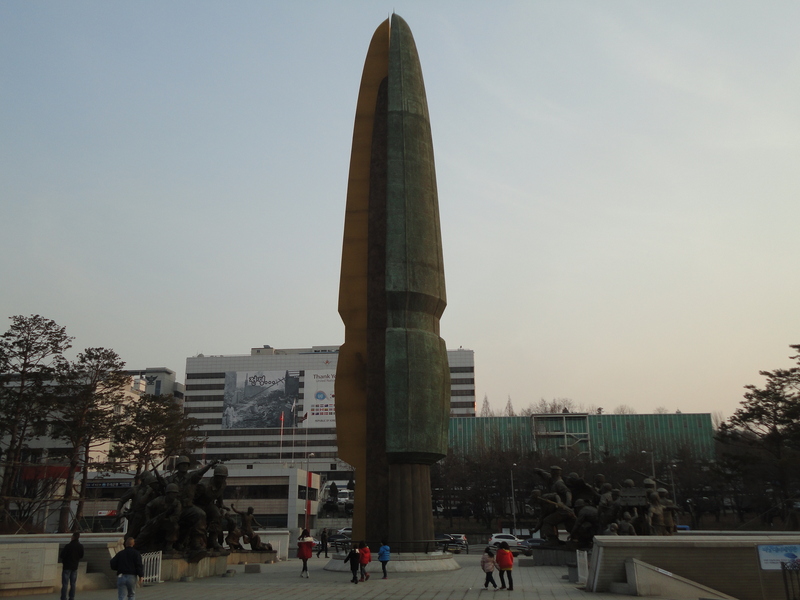 It is the closest train station to North Korea and trains actually run to here, as of 2014, but not any further. 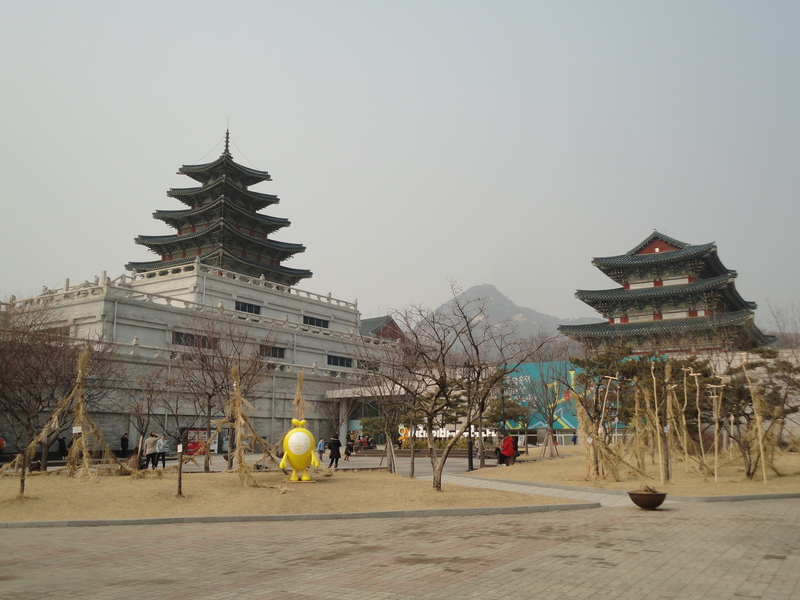 Last year in February, I finally went on a trip to South Korea. 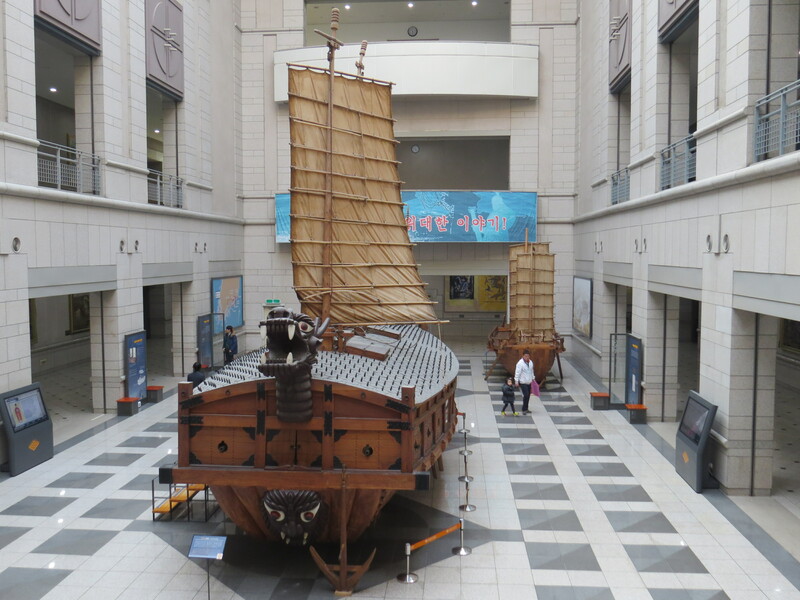 As a modest-sized nation between two larger powers (China and Japan) but punching way above its weight economically, technologically and culturally, South Korea deserves a lot of admiration. 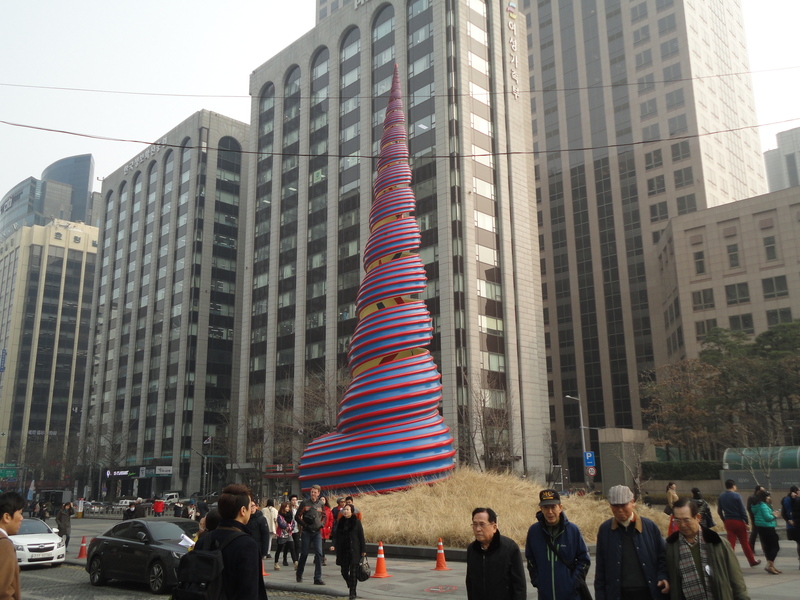 I only visited Seoul for a few days which I squeezed out of a week off going back to Taiwan from Beijing. It was short but enough to appreciate how modern and attractive the city was. 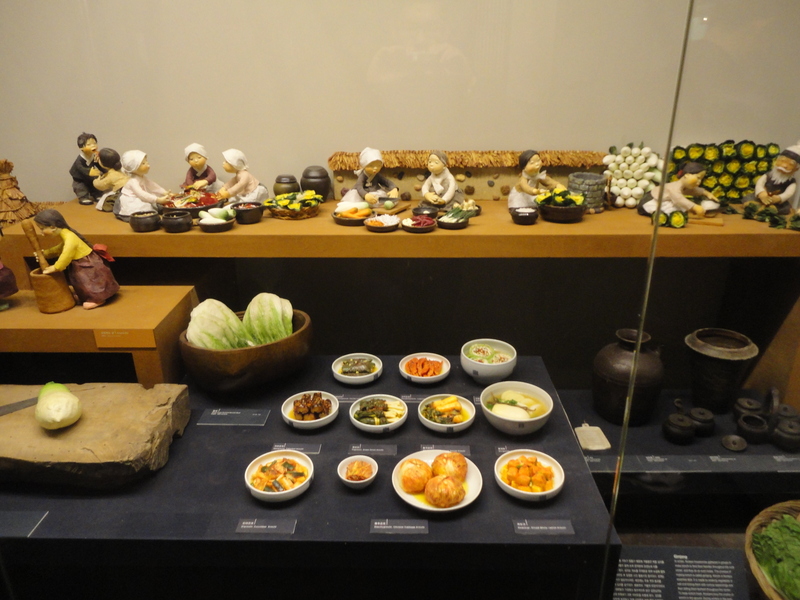 I visited the history and military museums, the DMZ (the demilitarized zone between North and South Korea), Gyeonbokgung palace, the contemporary art museum, and Myeong-dong, the well-known shopping area. 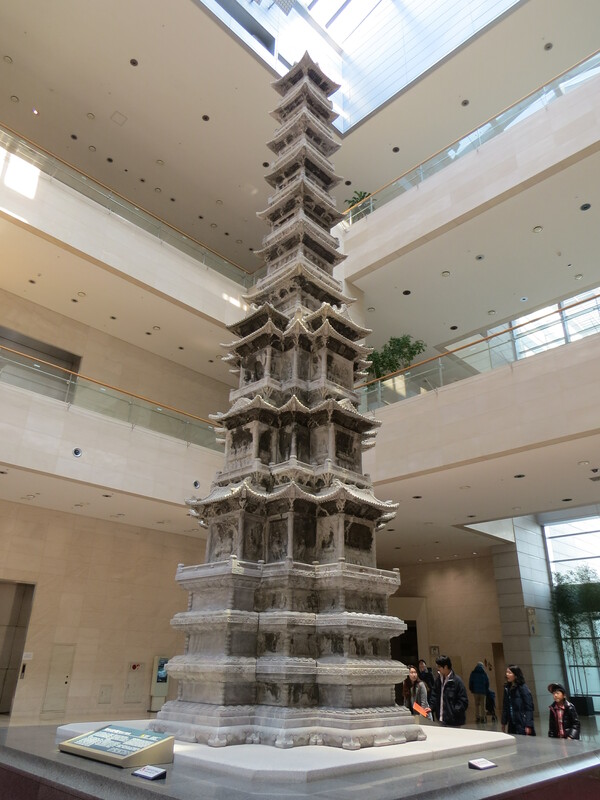 The city had a good mix of ultra-modern sights and historic buildings like the royal palaces, but the main indicator of how nice a city is its regular buildings, and I found Seoul’s to be rather attractive, especially compared to Taipei. 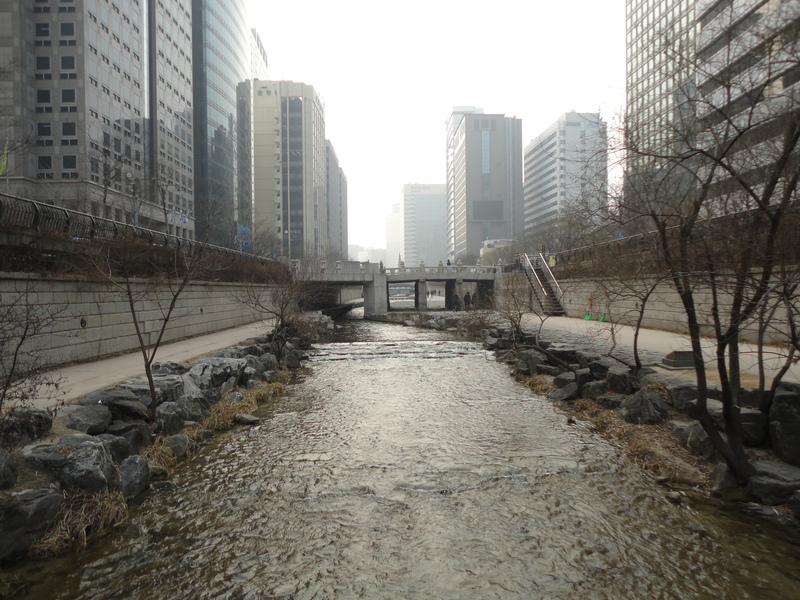 To be honest, I found Seoul to be more modern than I’d expected and almost as interesting as Tokyo. 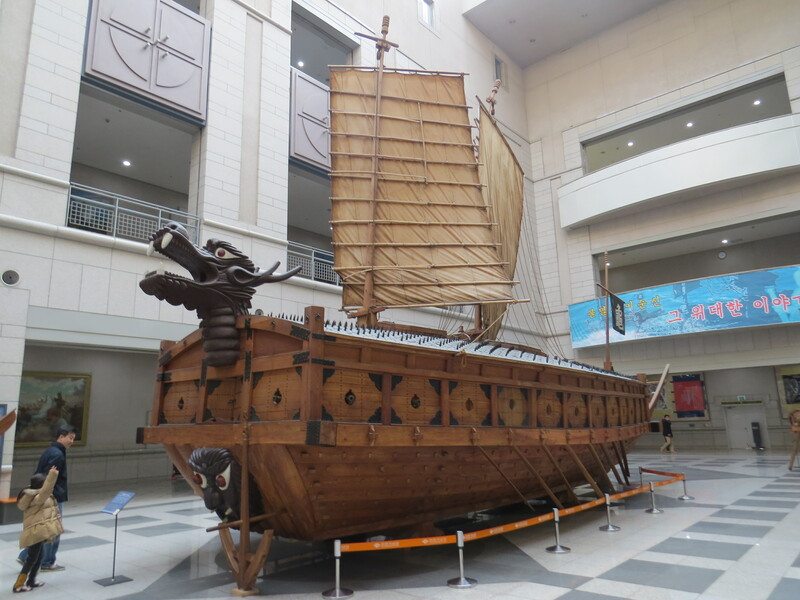 Many Taiwanese consider South Korea to be a rival in economic and sporting terms (while South Korea considers Japan its rival), but looking at Seoul, I think Taiwan is in danger of falling so far behind that there is no competition. 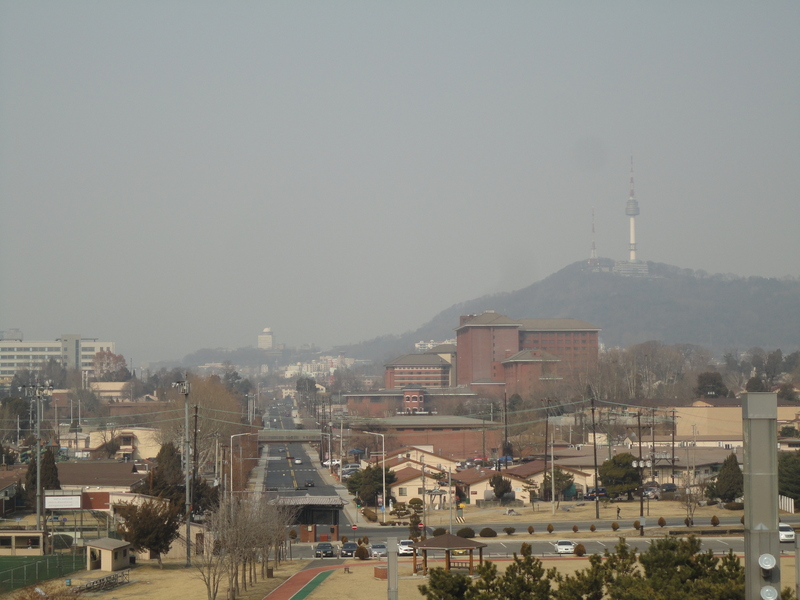 The only drawback to Seoul was that the air was hazy while I was there, very likely courtesy of China. 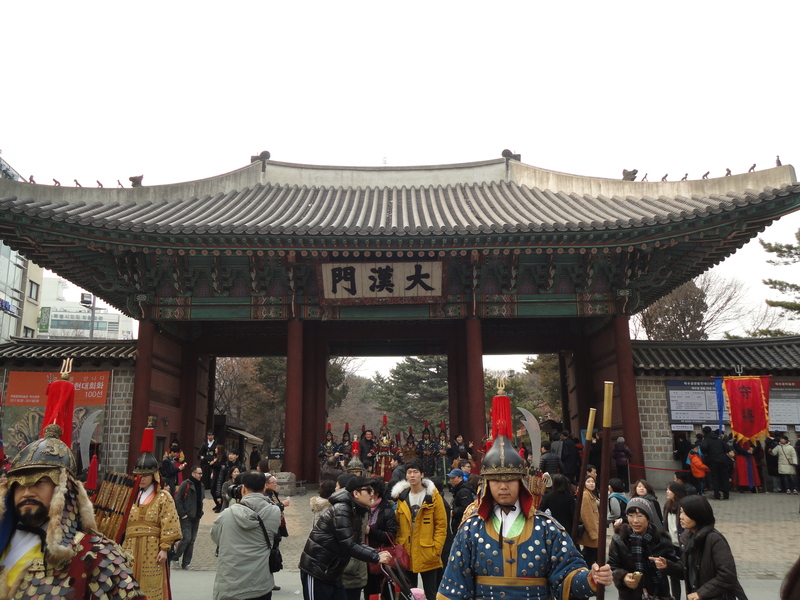 I also wrote about Seoul for the Chinese paper I worked for in this travel feature story. 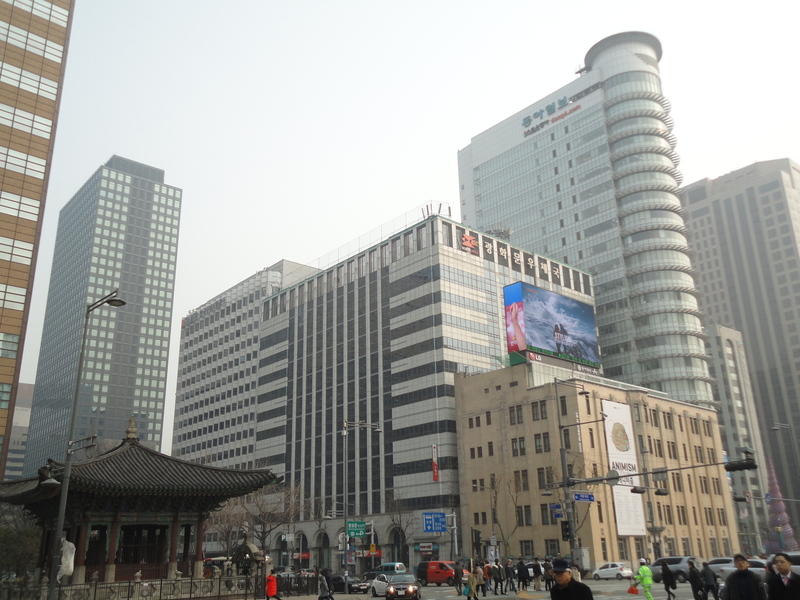 I stayed in Dongdaemun, a well-known shopping and fashion district filled with department stores. 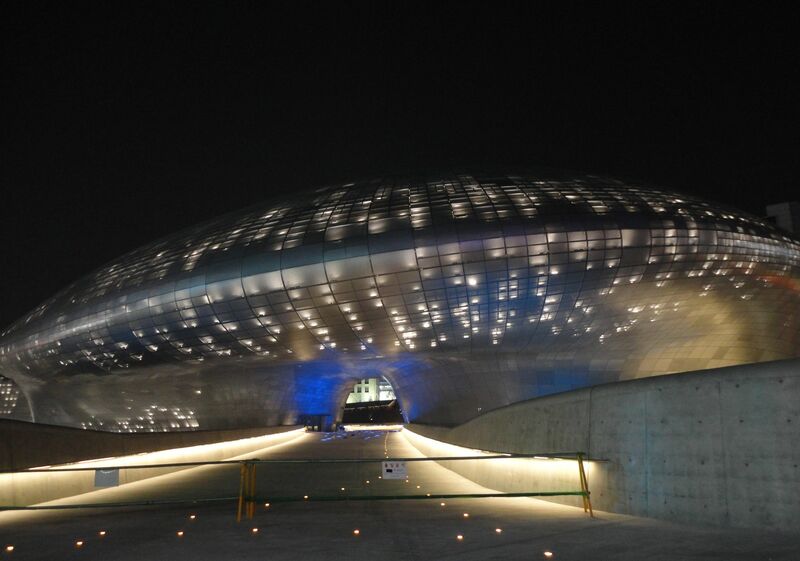 It also has the Dongdaemun Design Plaza, a $451-million-marvel designed by Zaha Hadid that looks like a giant grey spaceship. I can’t say I think any one building is worth that much money to build, but it was definitely a very unique building. It wasn’t open yet when I was there – it opened one month later in March. 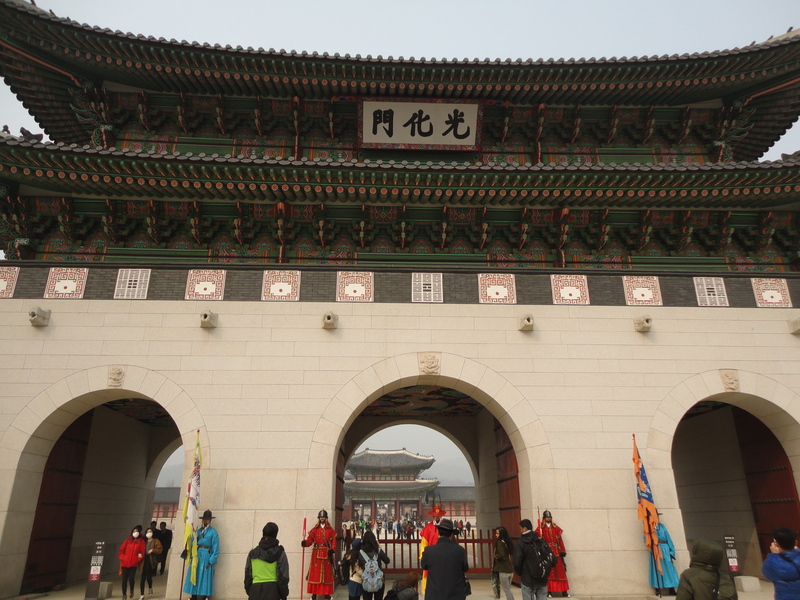 Dongdaemun means “Great East Gate,” because it features one of the two remaining gates of the old city walls that encircled the capital in the past. 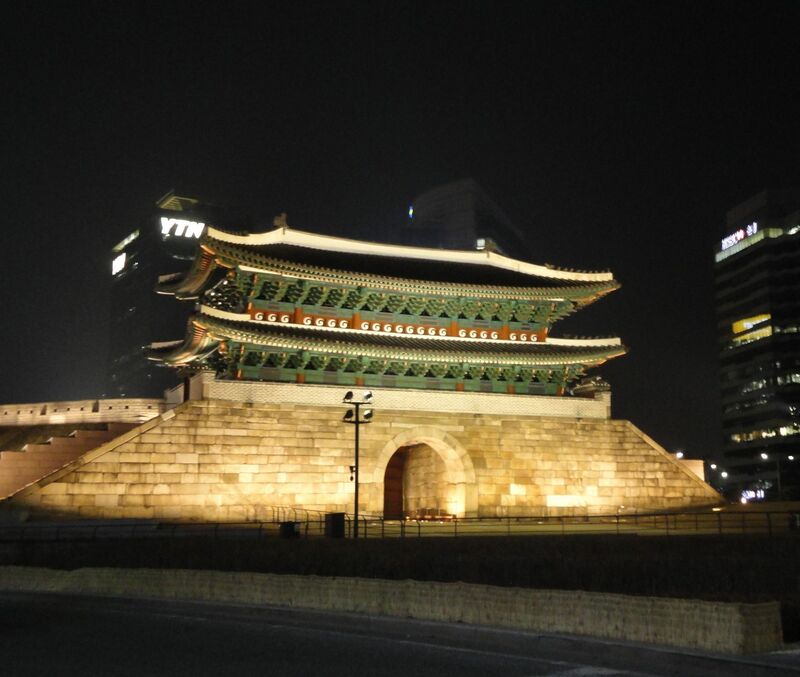 The more famous Namdaemun (Great South Gate) was severely damaged by fire in 2008 but restored by 2013. 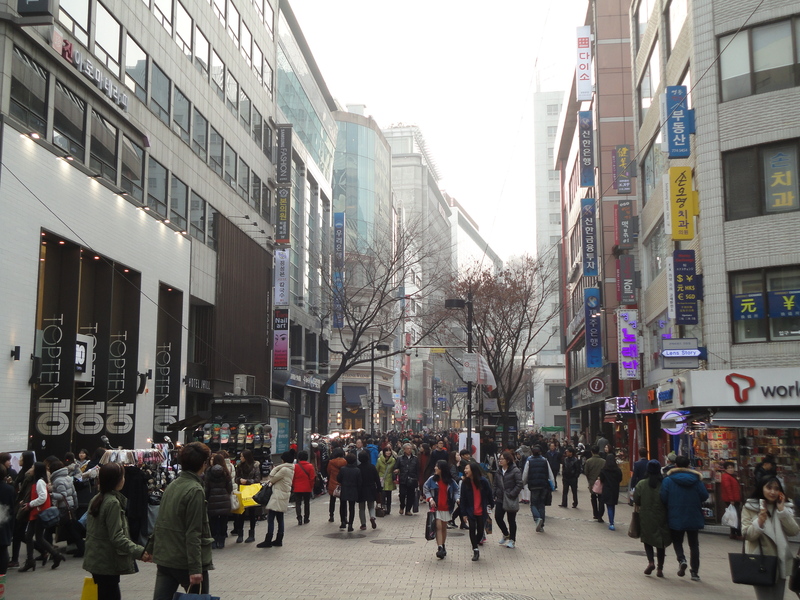 Myeong-dong, a shopping mecca, especially for Chinese tourists. 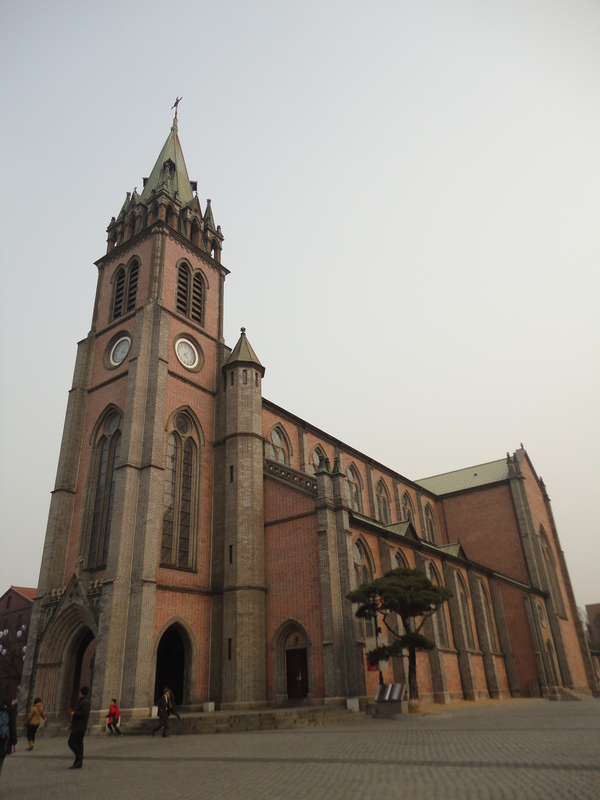 Myeong-dong does have non-shopping attractions like this Catholic cathedral, built in 1898. 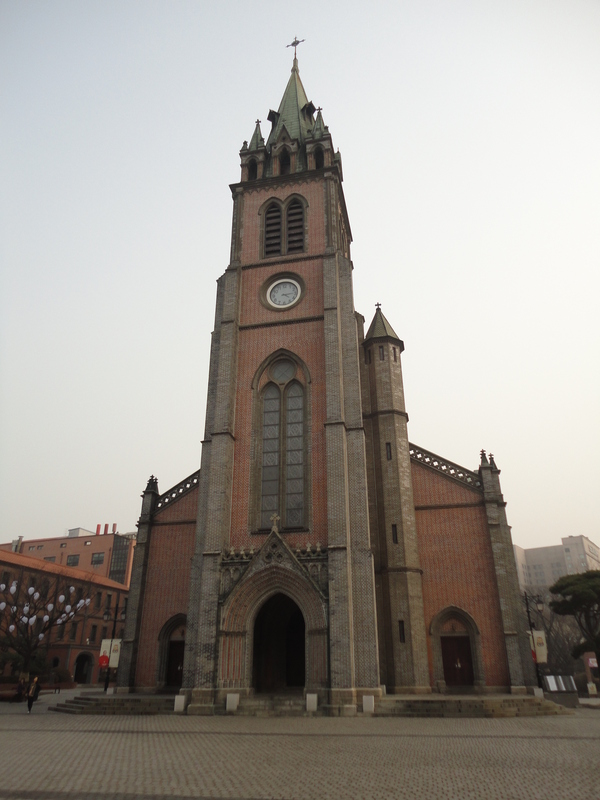 The country is heavily Christian, unique for Asia.